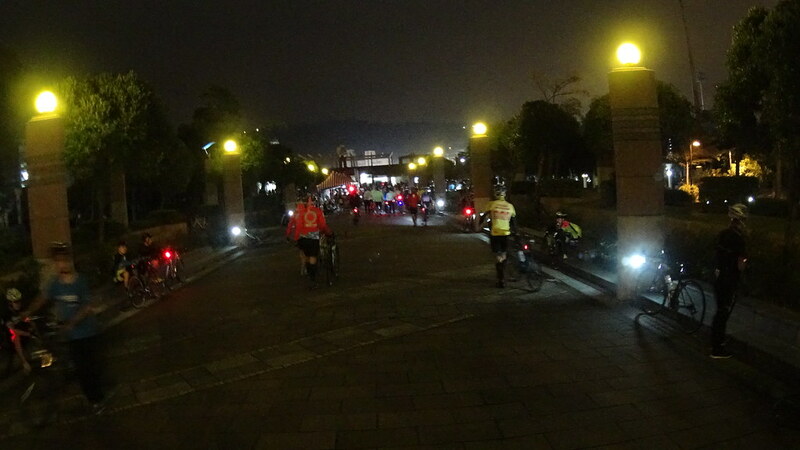 Starting Location: TianMu Sports Park, Taipei (天母運動公園). 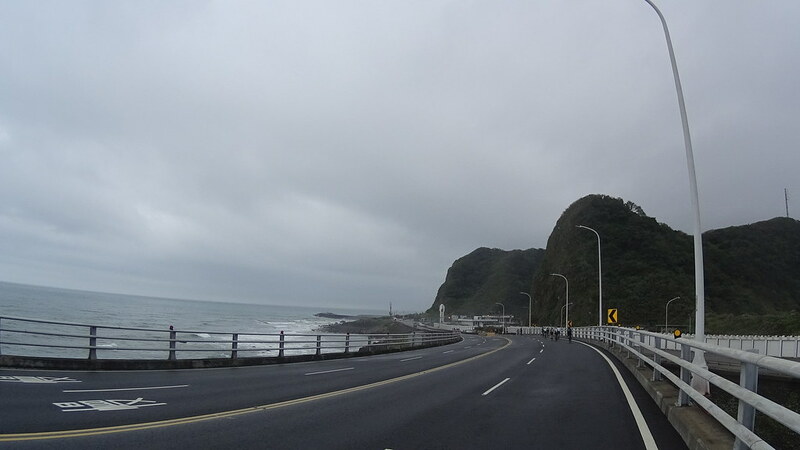 Length: 88km. 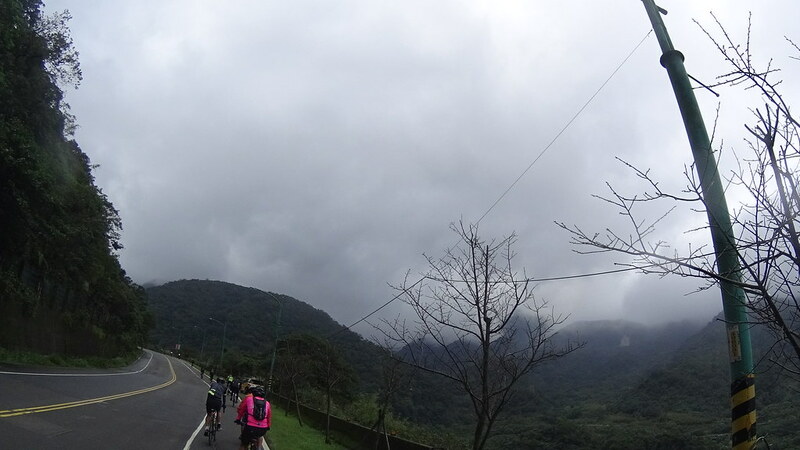 Elevation gain: 2400 m.
Hill profile: Very Hard: two major hills, one at the end. 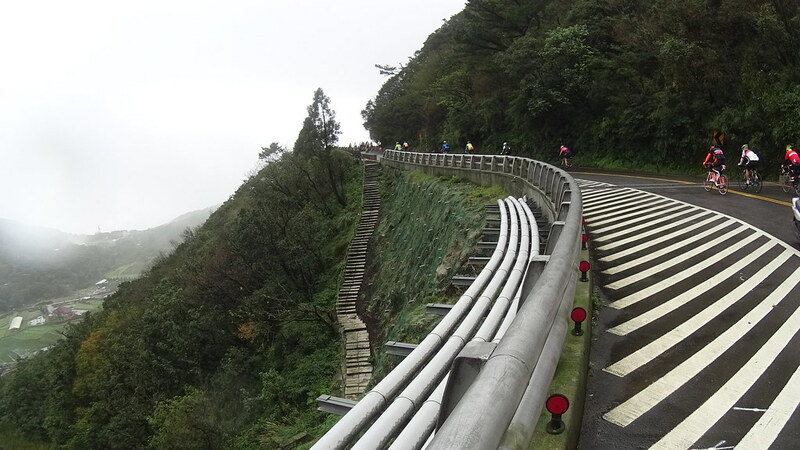 Two very steep sections, one at the end. 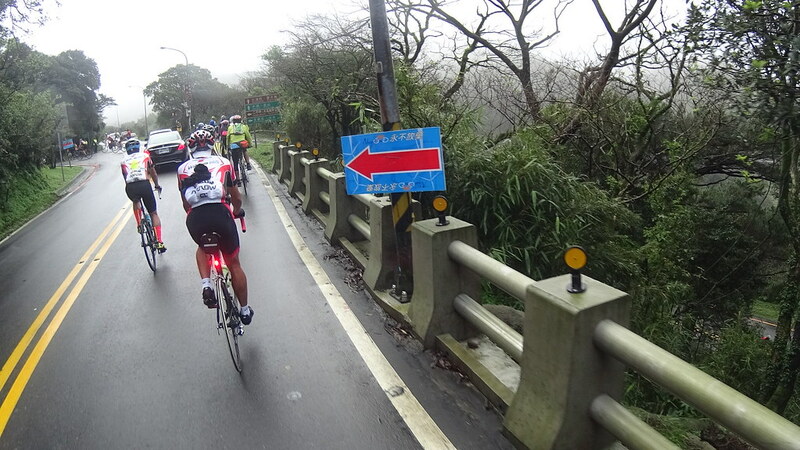 WARNING: Be careful when descending! 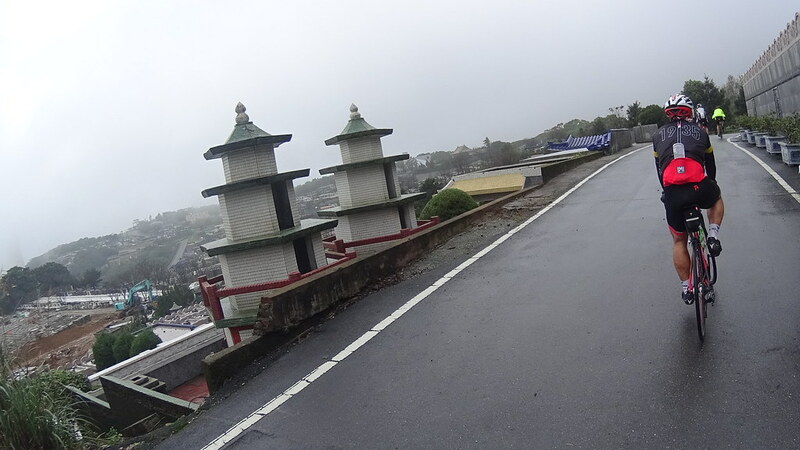 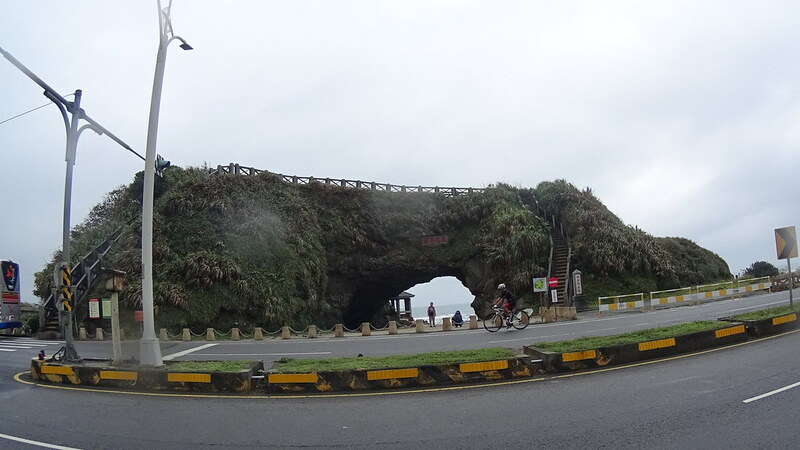 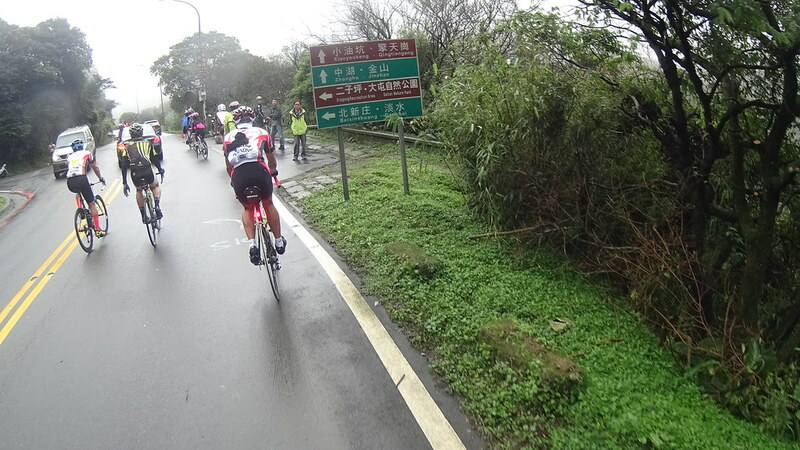 As YangMingShan rains a lot and is constantly in mist, roads can be very slippery and grows mosses at roadside. 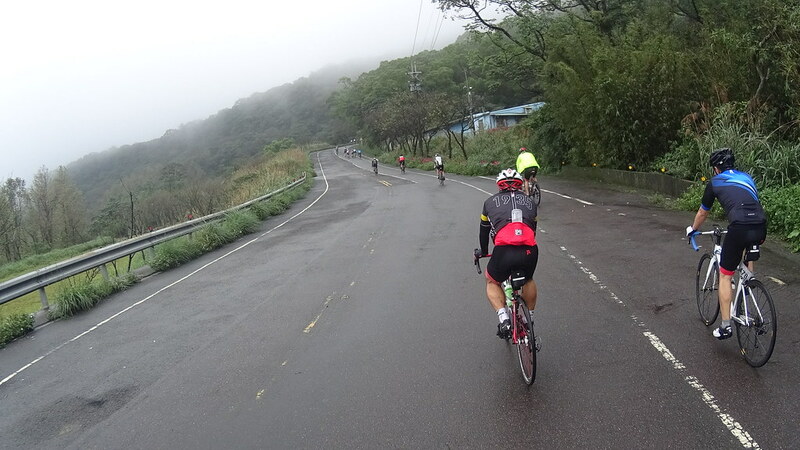 All-in-one training (long hill climb, steep hill climb and long sprinting). 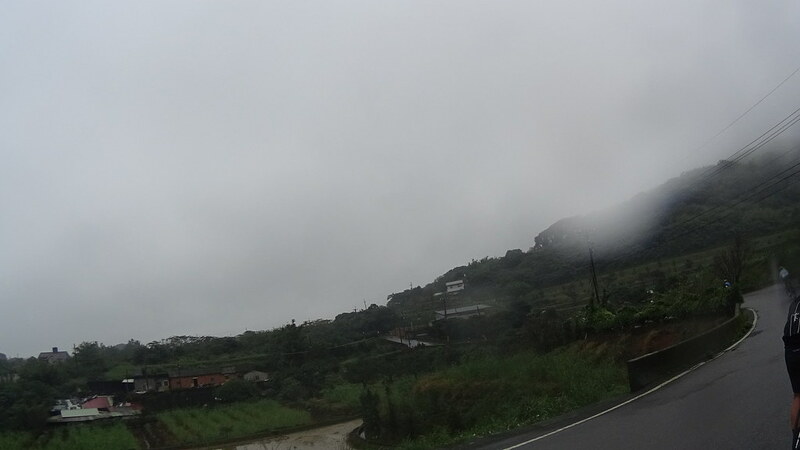 Volcanic geology and rotten egg smell. 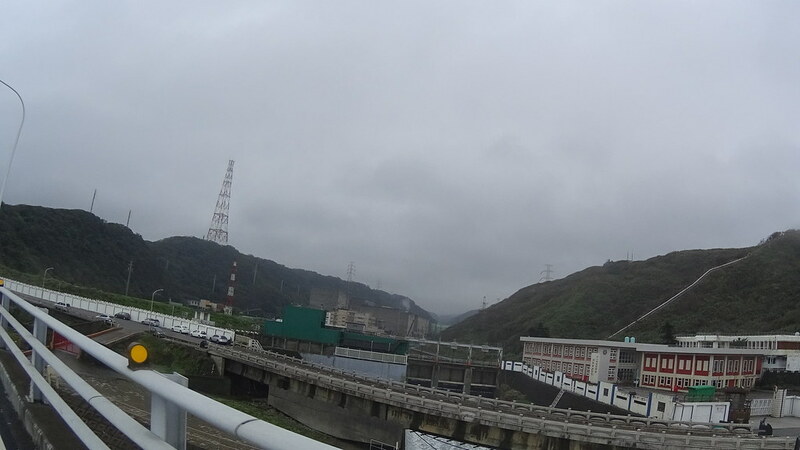 Power plants (wind and nuclear). 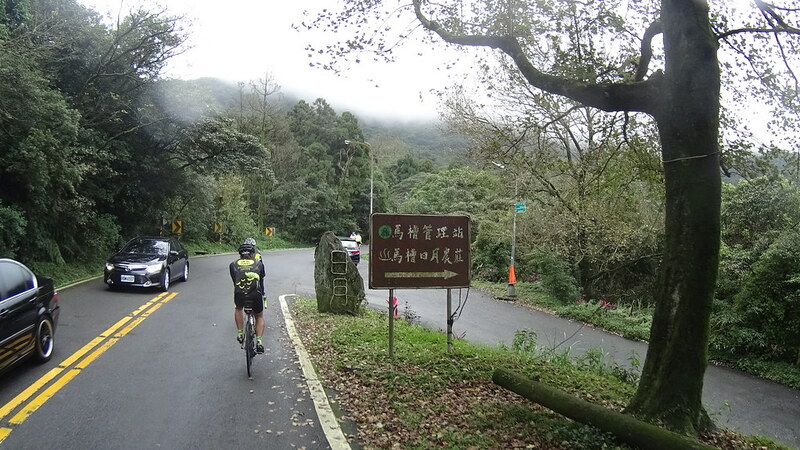 The YangMingShan National Park (陽明山國家公園) is situated north of Taiwan’s capital Taipei. 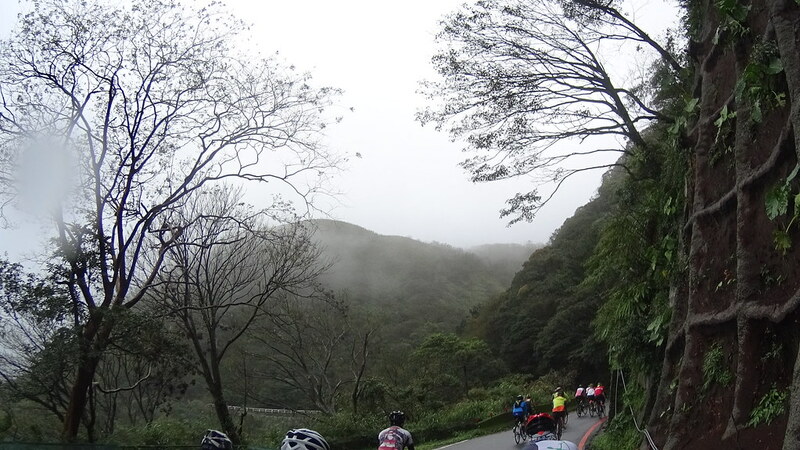 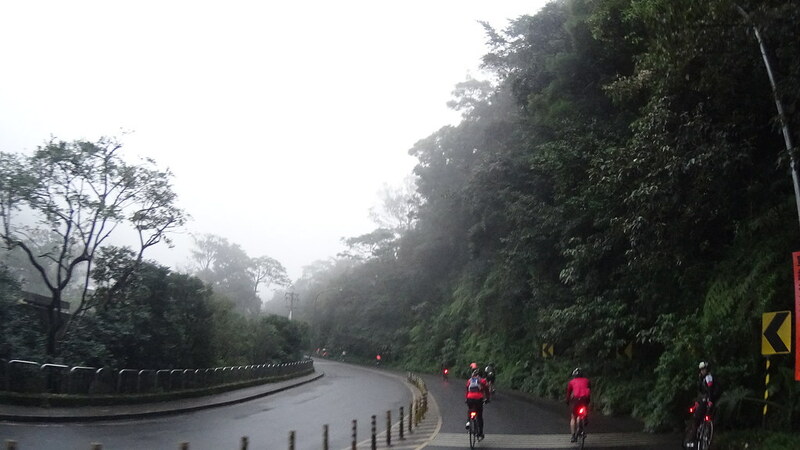 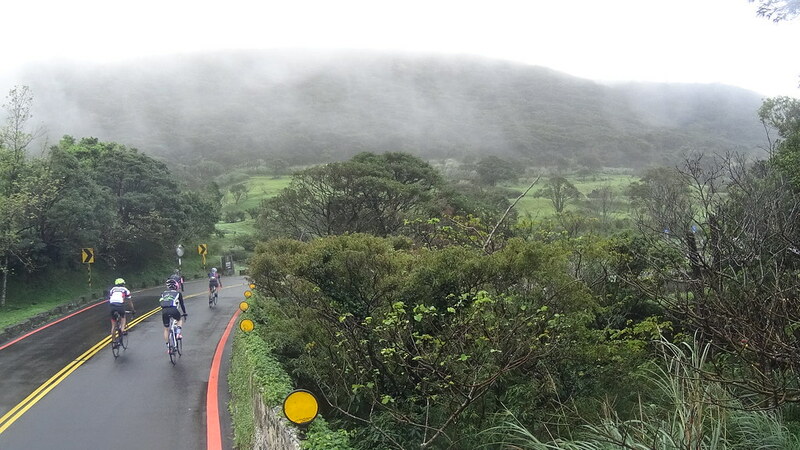 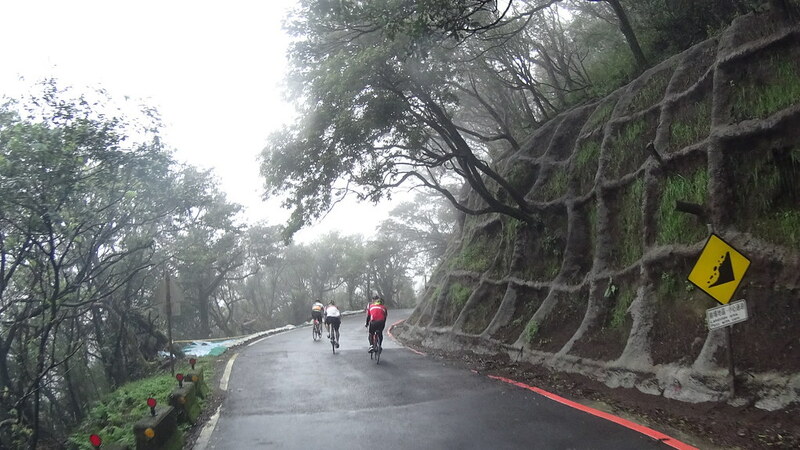 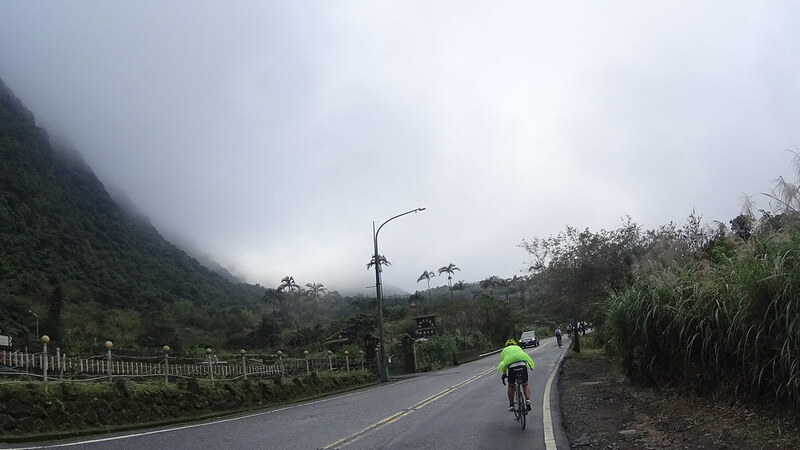 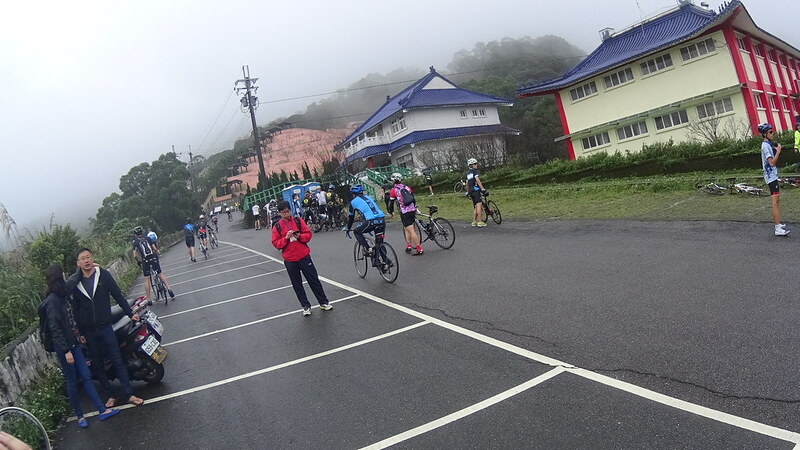 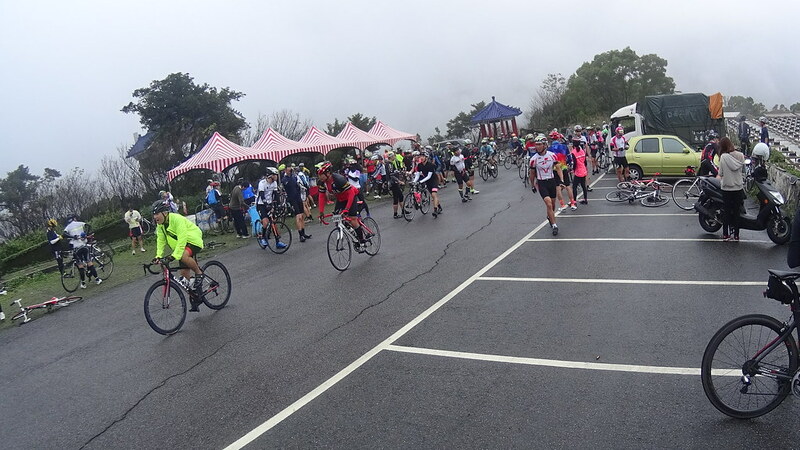 With its volcanic geology (hot springs the most popular), unique cultural history and having the highest elevation route near Taipei, YangMingShan is special for Taiwan’s cycling community, with the P-shaped route constantly being the top three popular climbing routes (along with Wuling and Tataka). 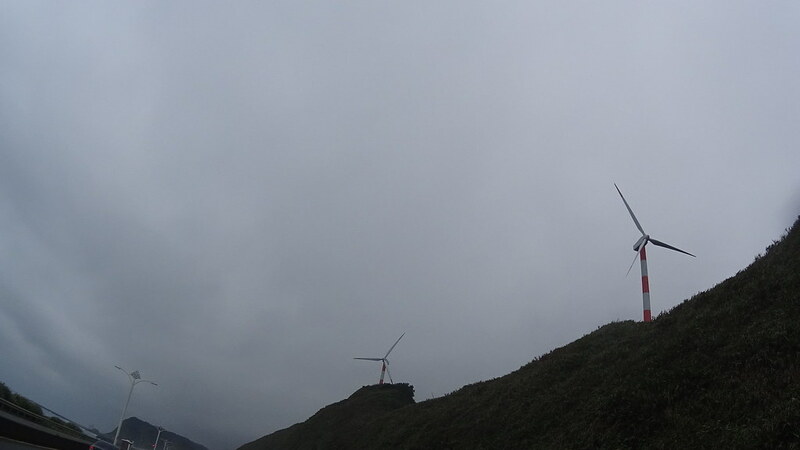 Unique cone-shape volcanic hills at YangMingShan. 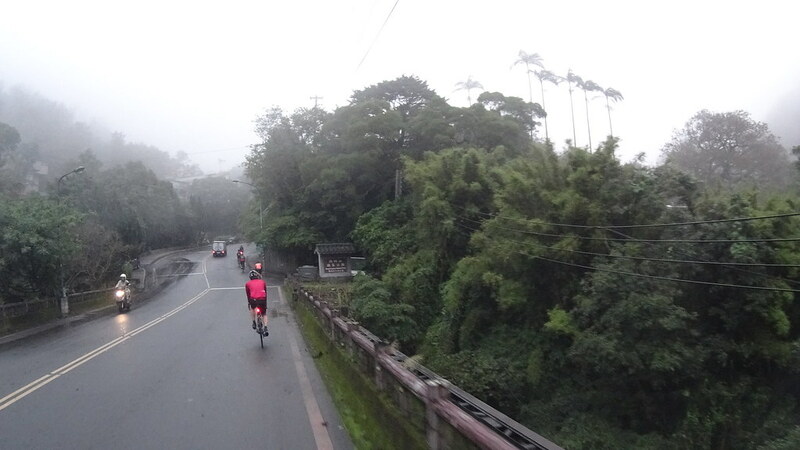 For centuries the power of volcanic activities produces evidence of lives at southern part of YangMingShan: Beitou hot springs (北投溫泉), historical buildings and major park recreational areas. 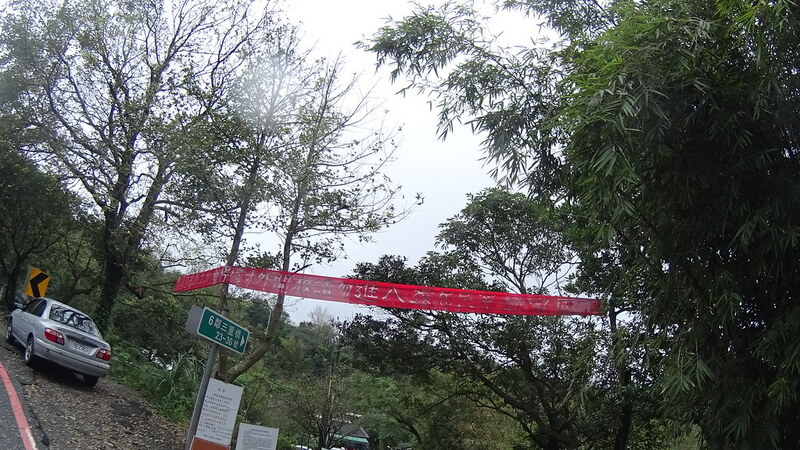 Major college town area of Chinese Culture University (中國文化大學) at south of park’s main entrance. 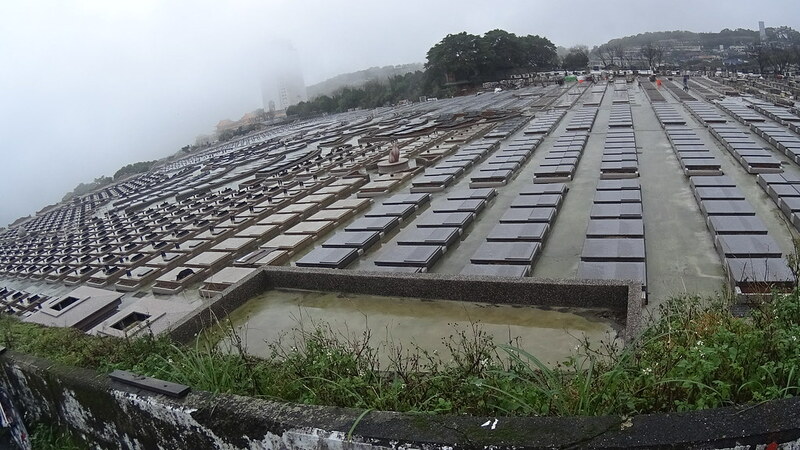 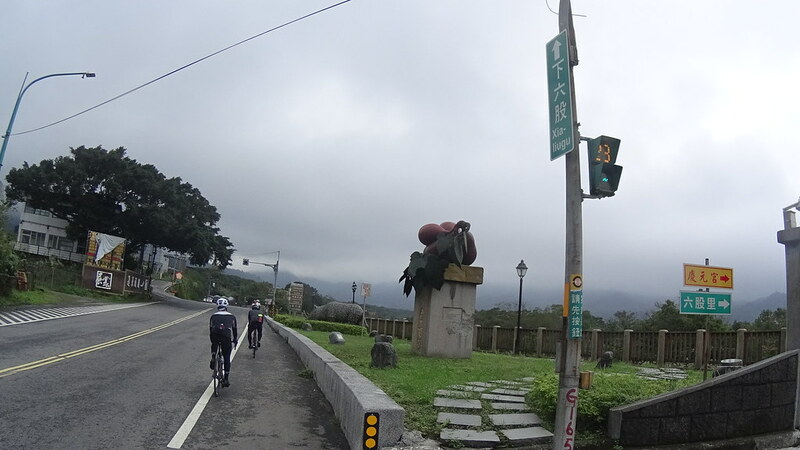 On the other hand, what fewer people know is that the northern part of YangMingShan holds things that don’t belong to daily lives, like massive cemeteries and a nuclear power plant. 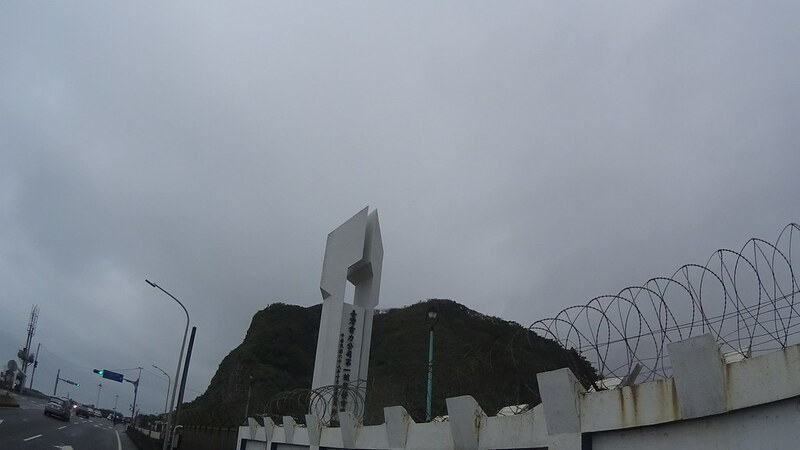 The place for the dead. 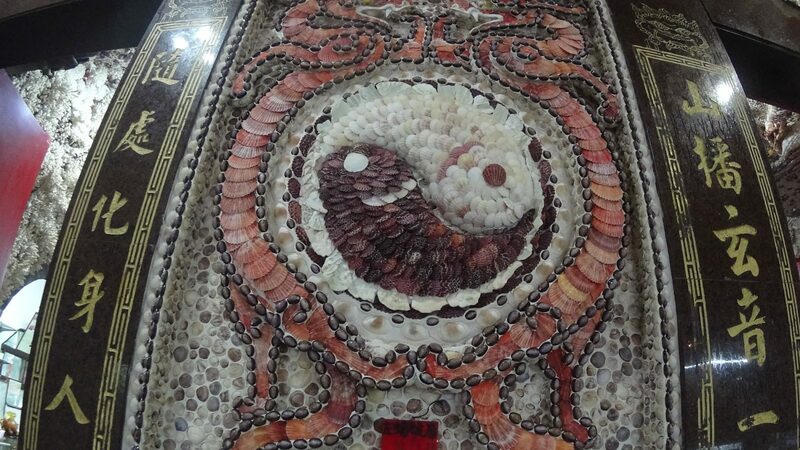 Finally, death can be put into life, just like this temple’s TaiChi’s symbol made by dead seashells. 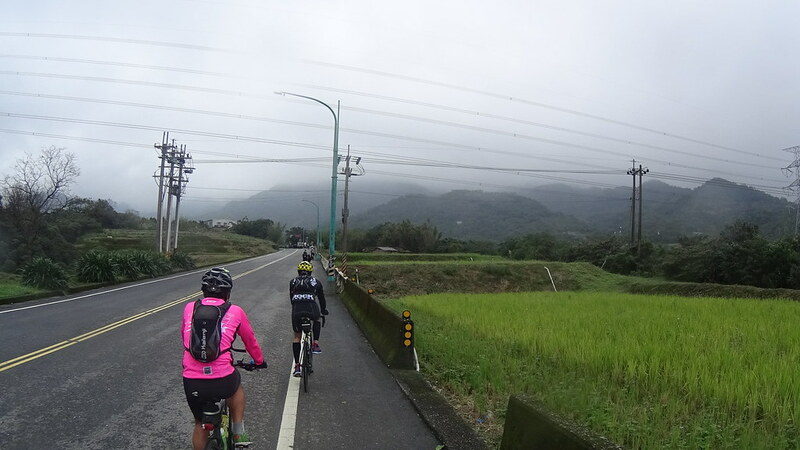 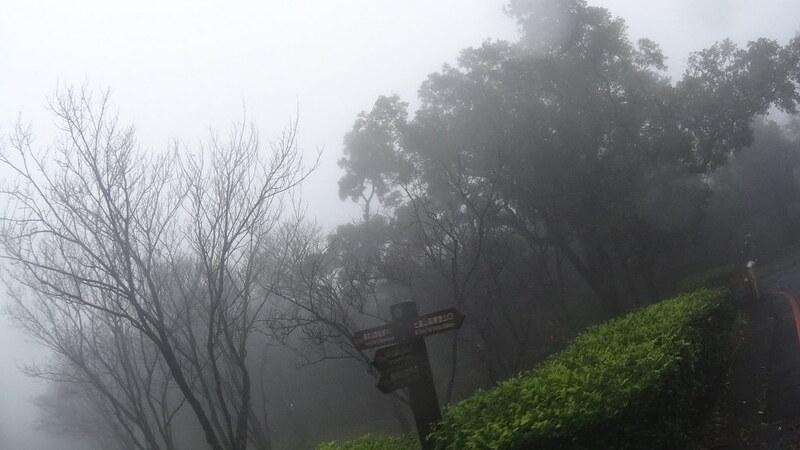 It would be great fun to explore these many aspects of YangMingShan. 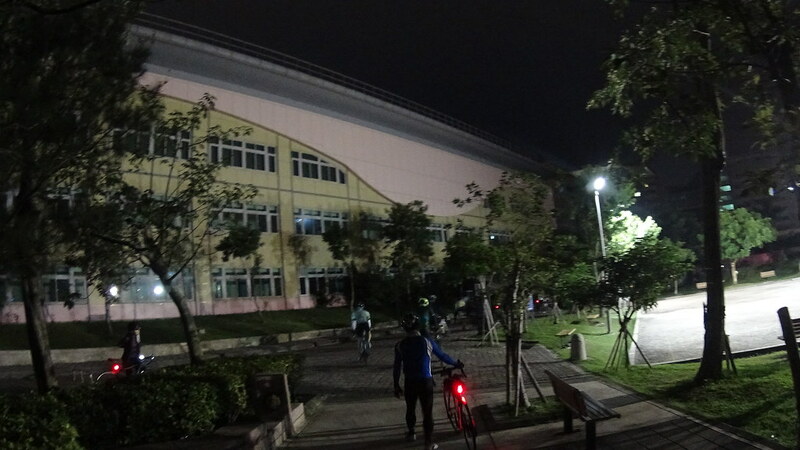 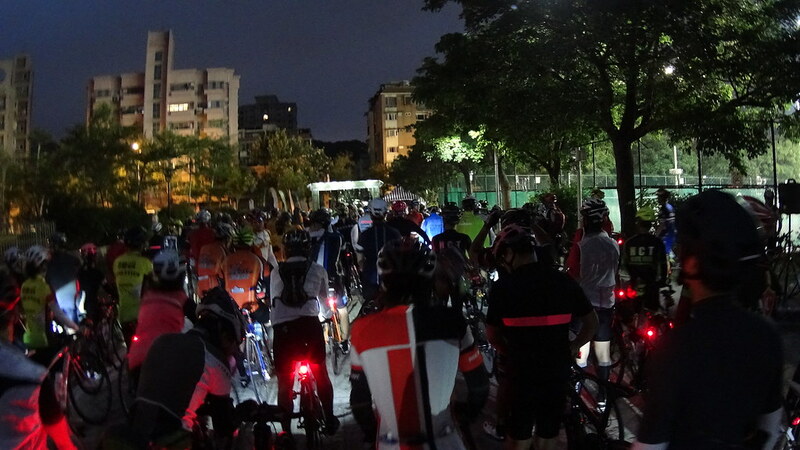 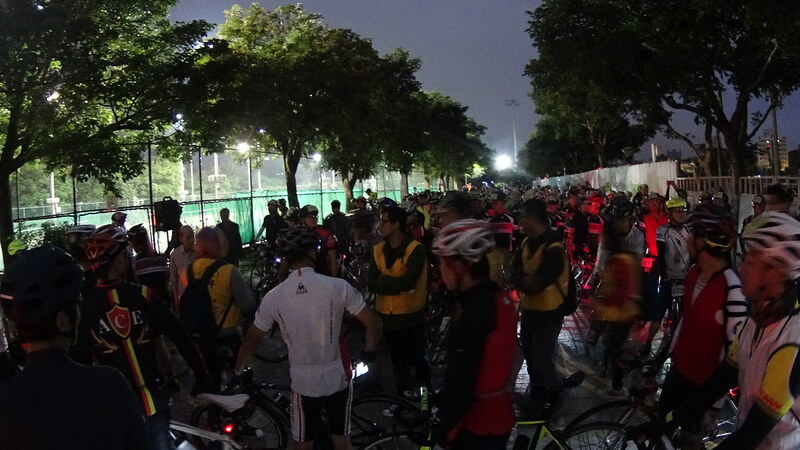 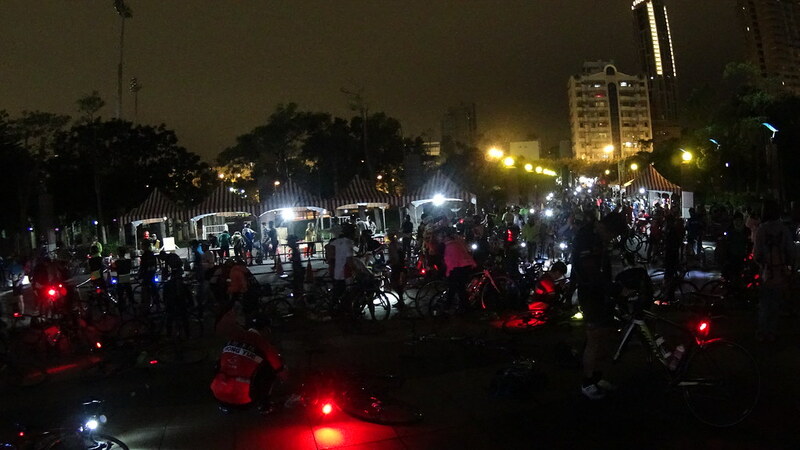 Our rides began at TianMu Sports Park (天母運動公園). 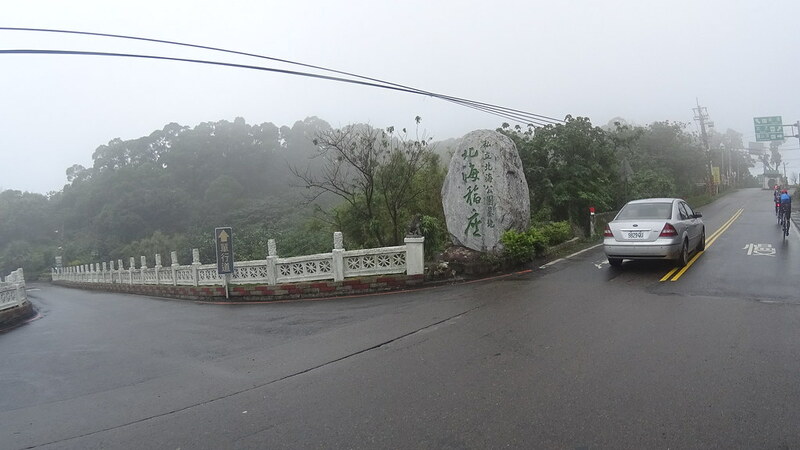 TianMu is famous for having many foreigner families. 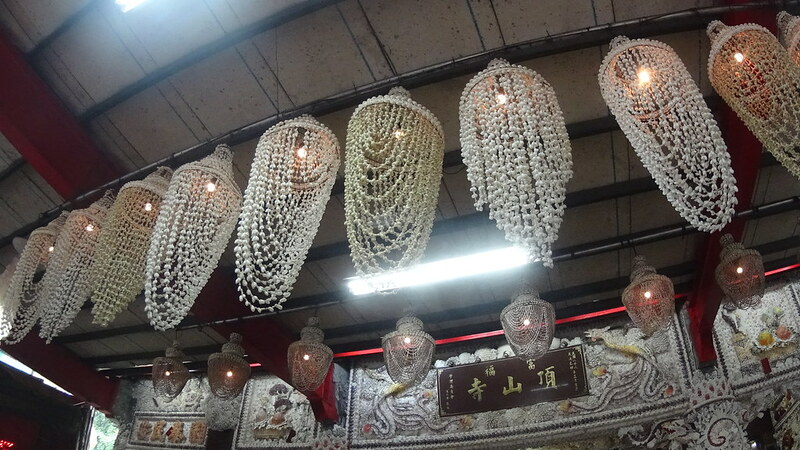 Dancing grandmas. 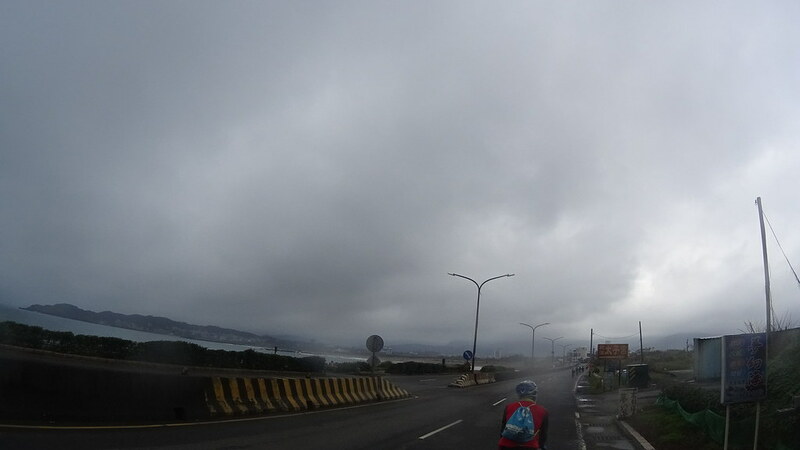 Shake it off. 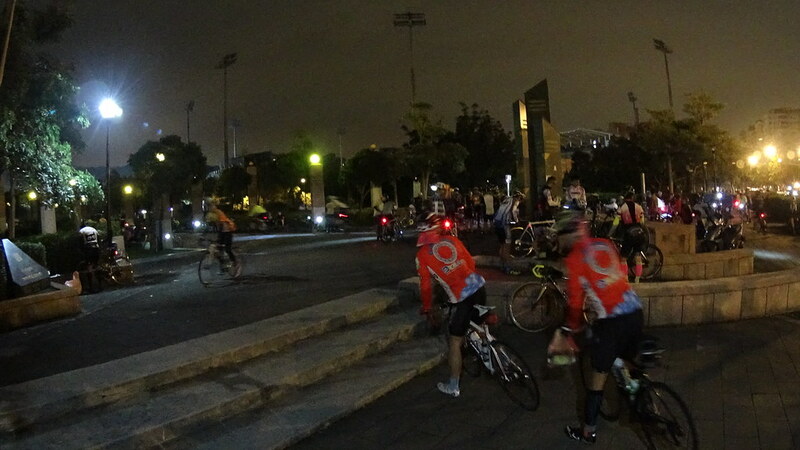 Riding around the field towards the starting point. 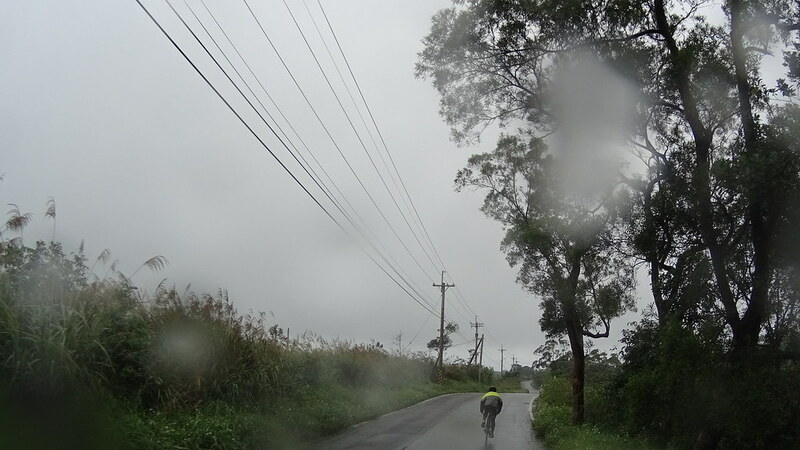 Bastards trying to cut in line from the side road. 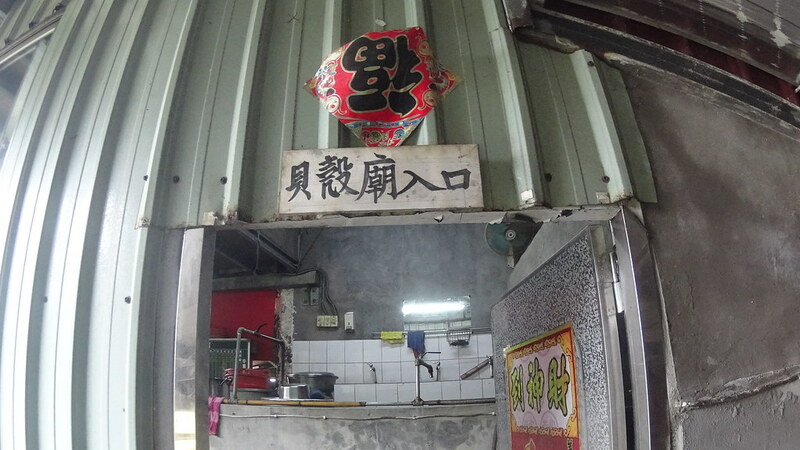 Too bad they were blocked by the staff. 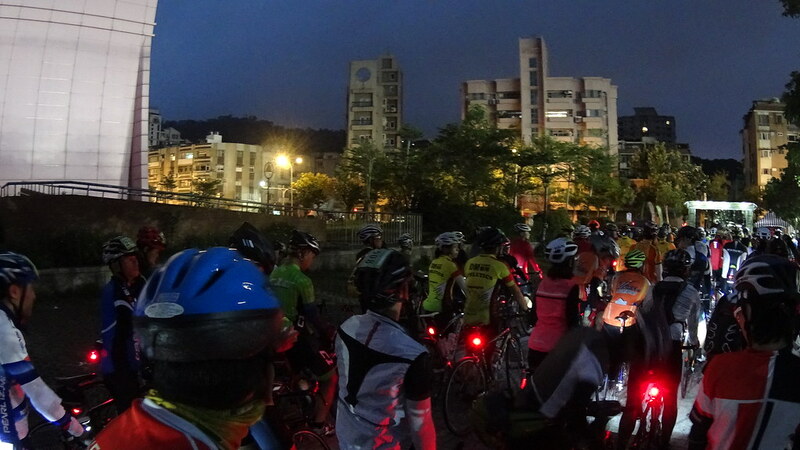 Starting point and Taipei night city view. 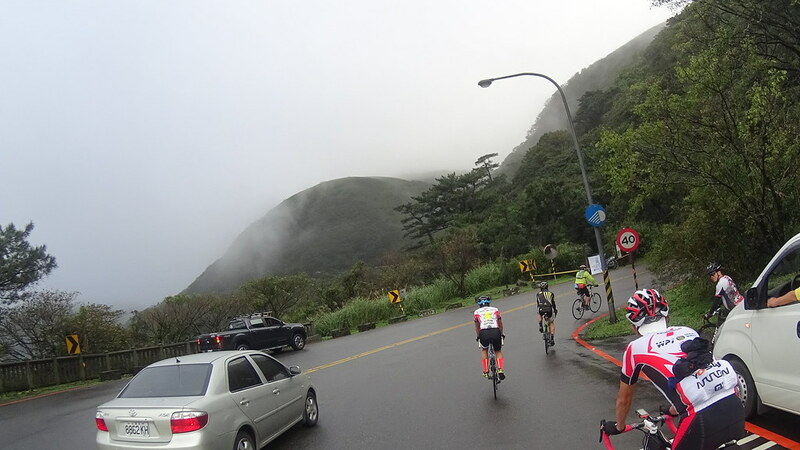 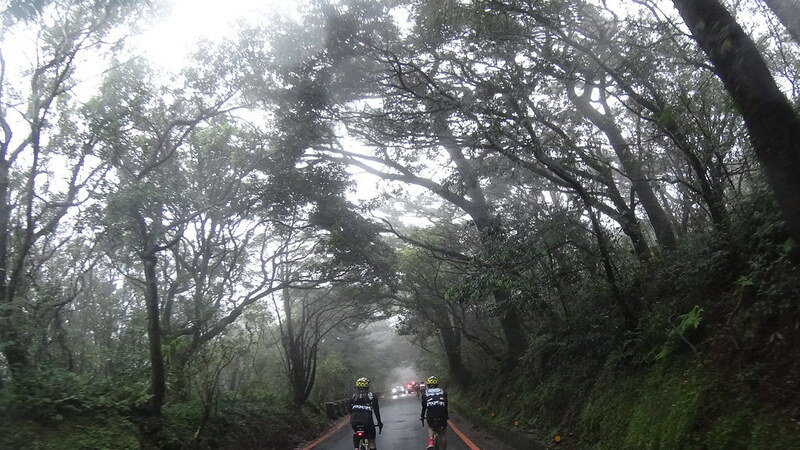 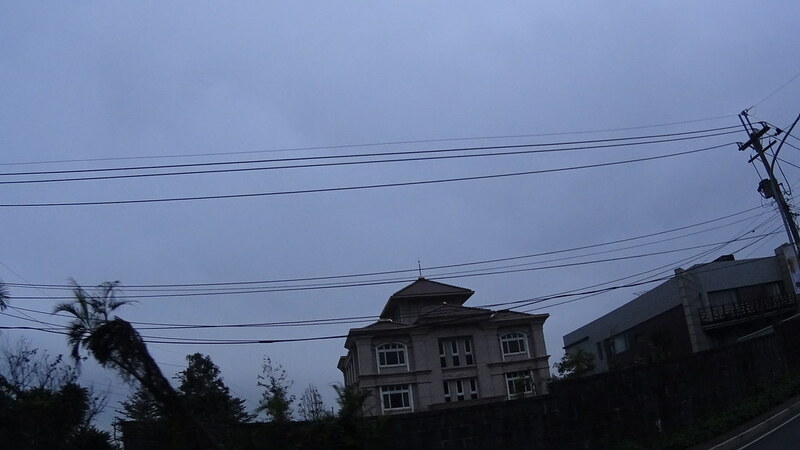 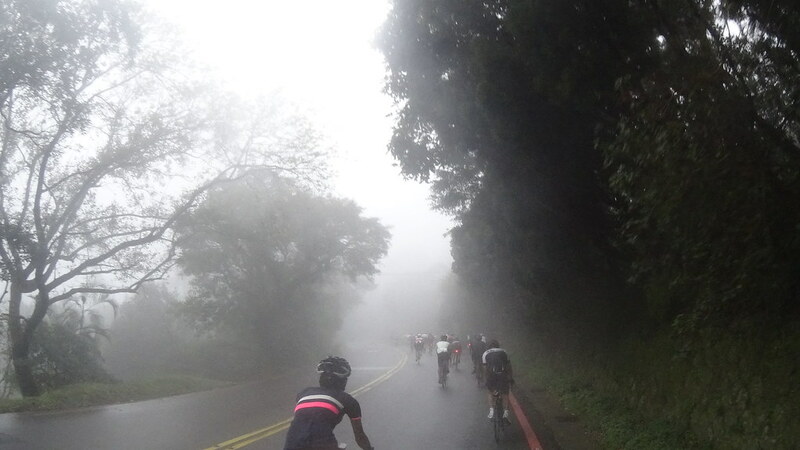 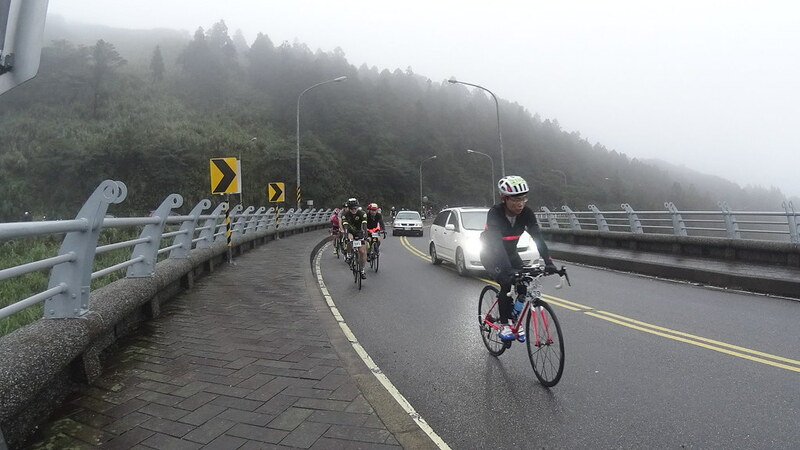 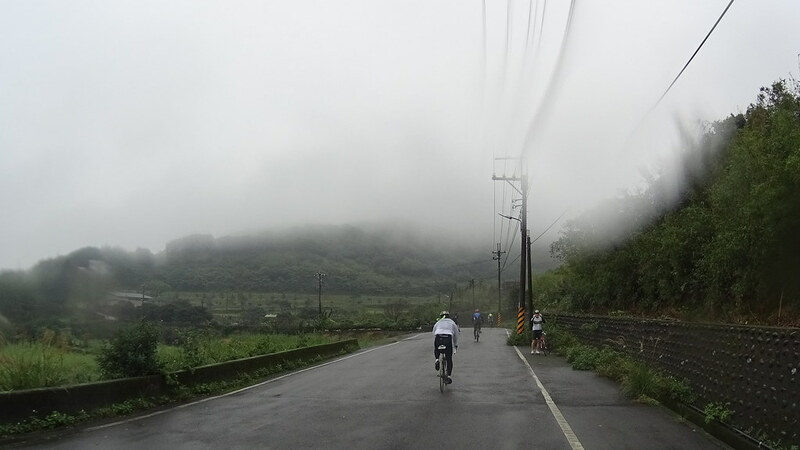 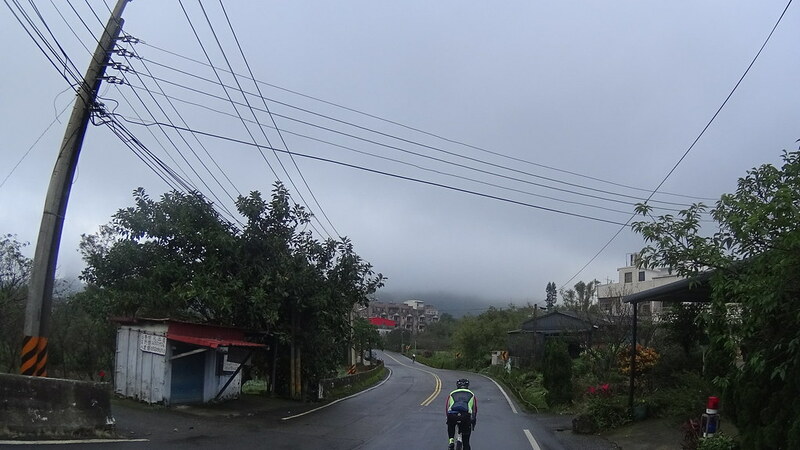 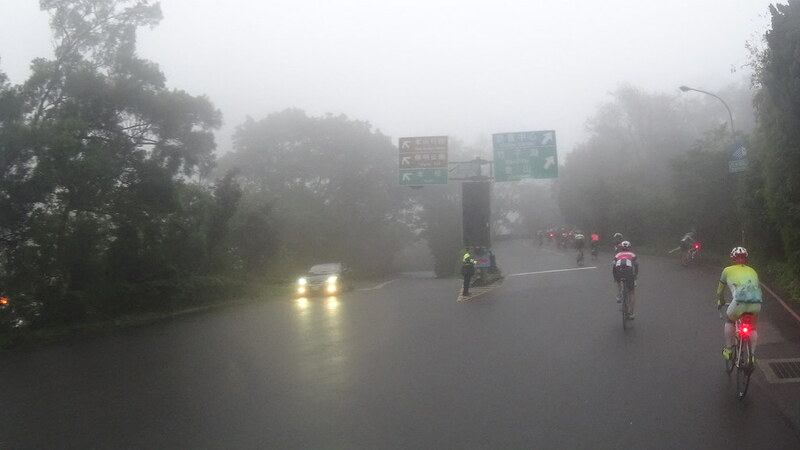 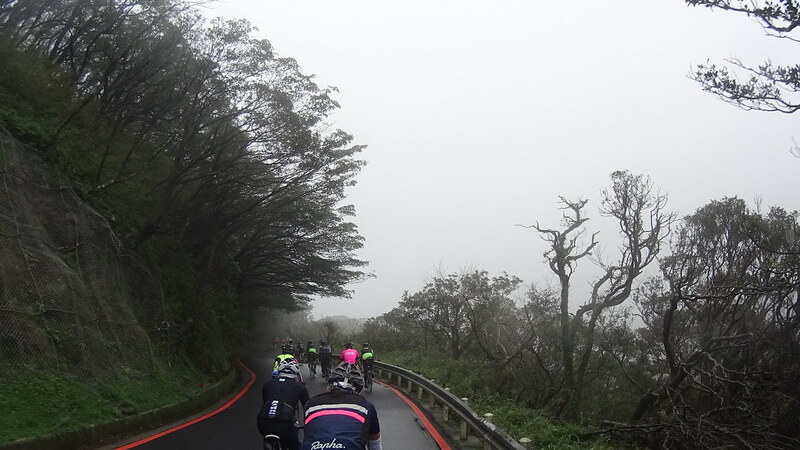 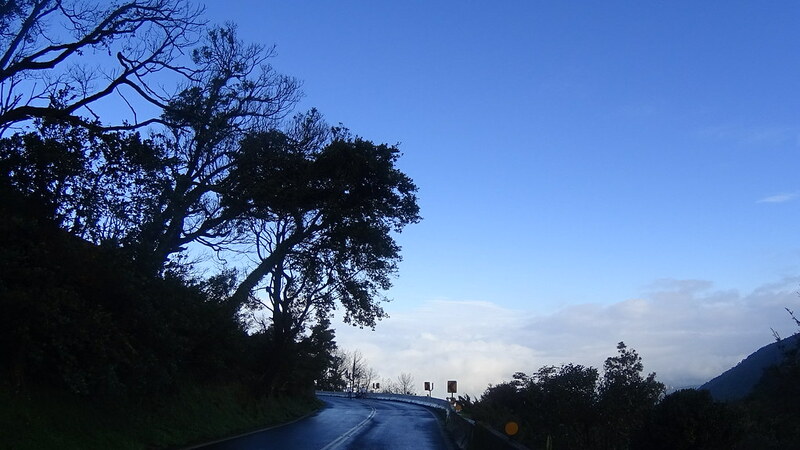 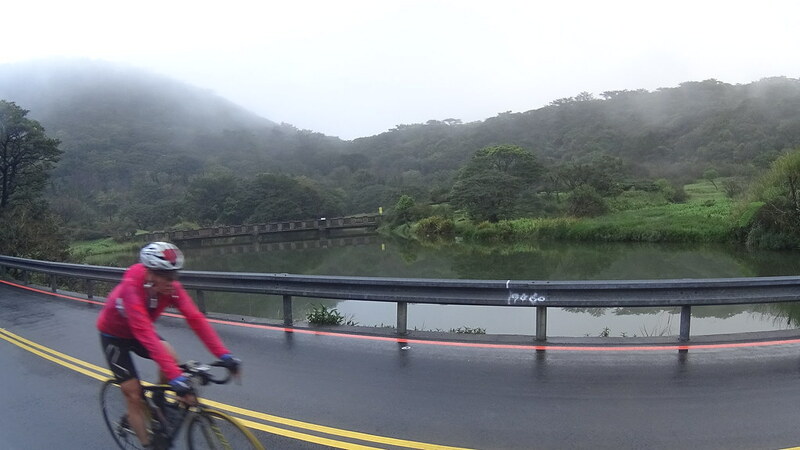 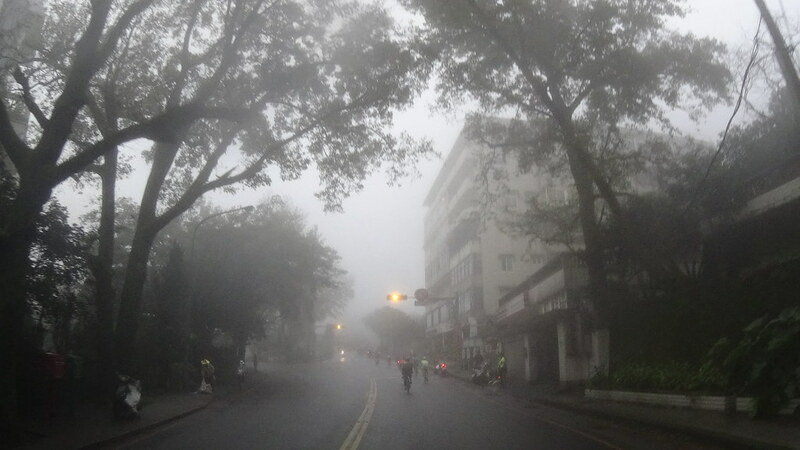 Soon the route went to State #2 Jia and started the climb towards YangMingShan. 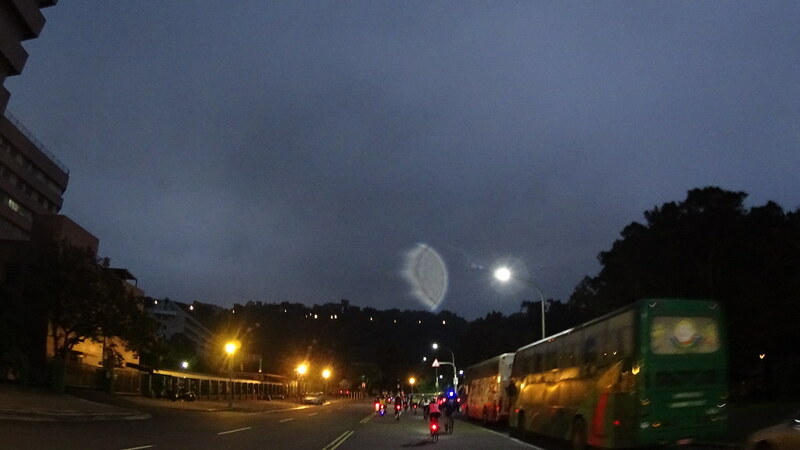 Bus signs. 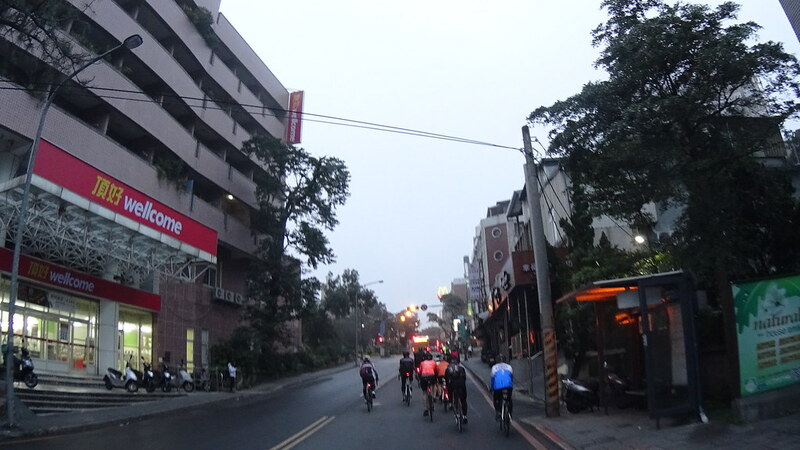 There were lots of city buses riding this route. 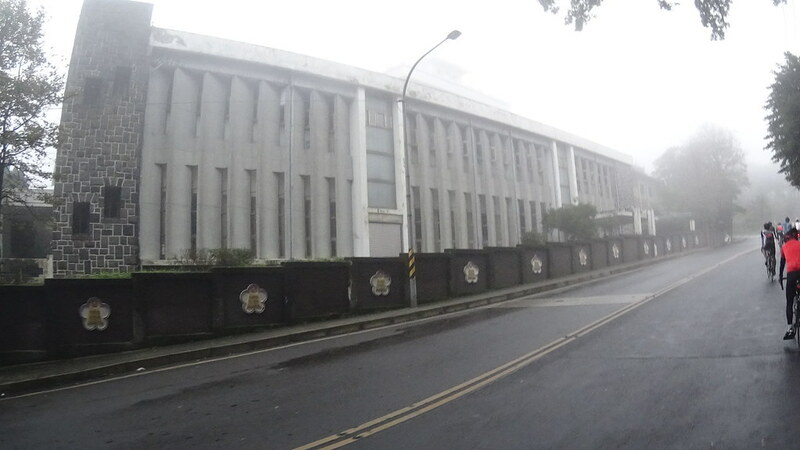 The wired fence is part of the National Security Bureau (國家安全局), Taiwanese CIA equivalence. 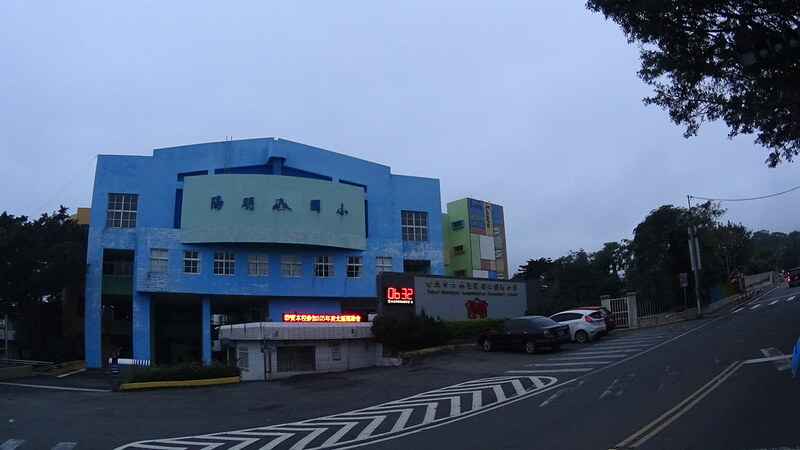 Private HuaXing Elementary School (華興國小). 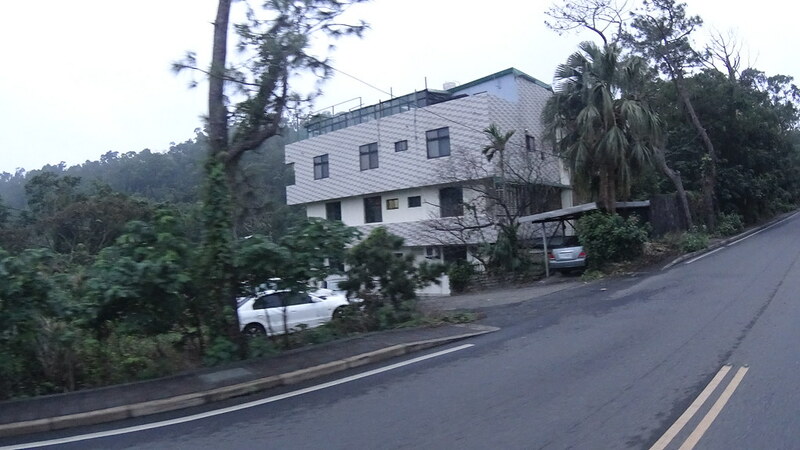 As Taiwanese people consider living on the mountains a privilege, this hilly section contained lots of high-end single houses (single house is extremely expensive in crowded Taipei area). 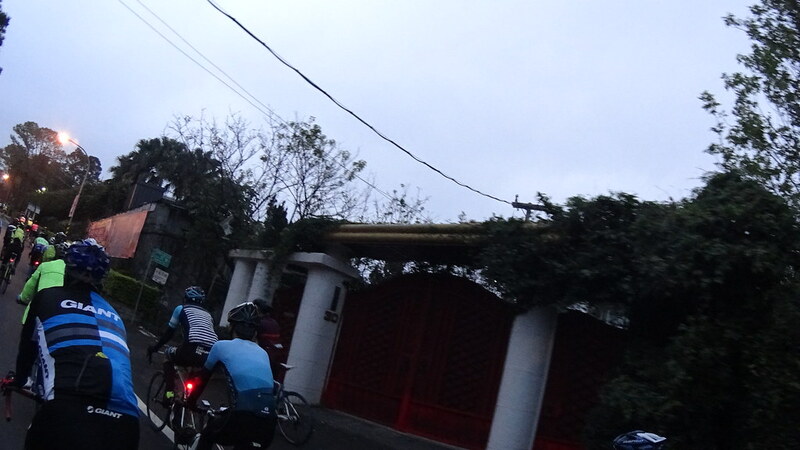 Along the way there was the house of Lin Yutang (林語堂故居). 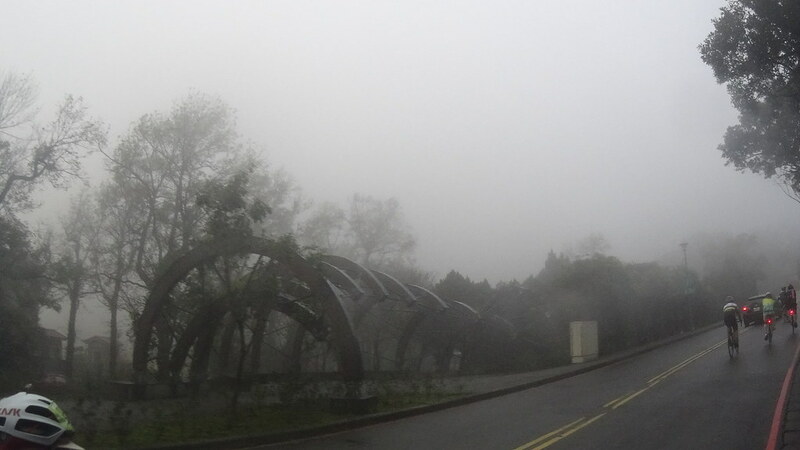 Lin was a former famous writer and Chinese classics english translator. 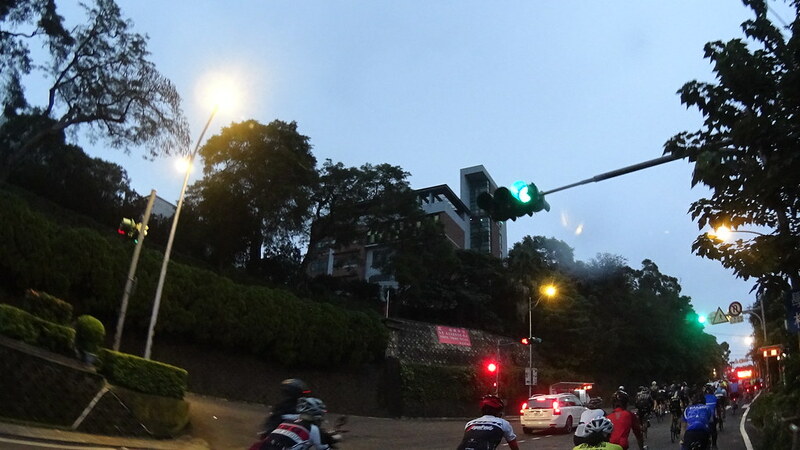 The route soon entered the last major town area south of YangMingShan, the college town of Chinese Culture University and Taipei European School. 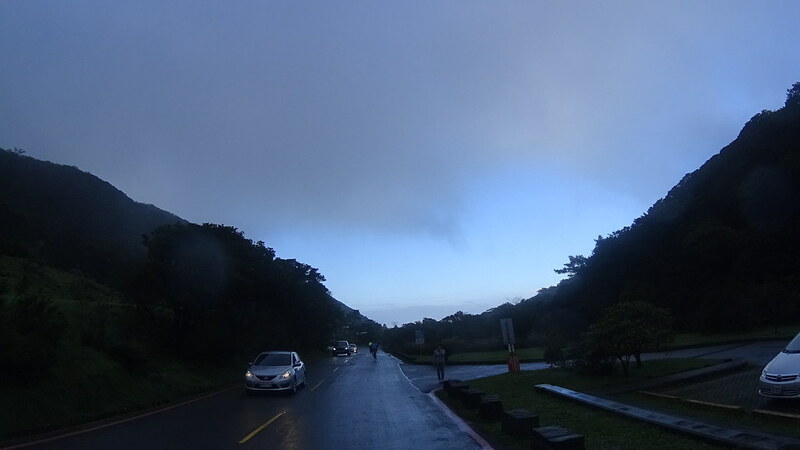 Can you find the Golden Arch? 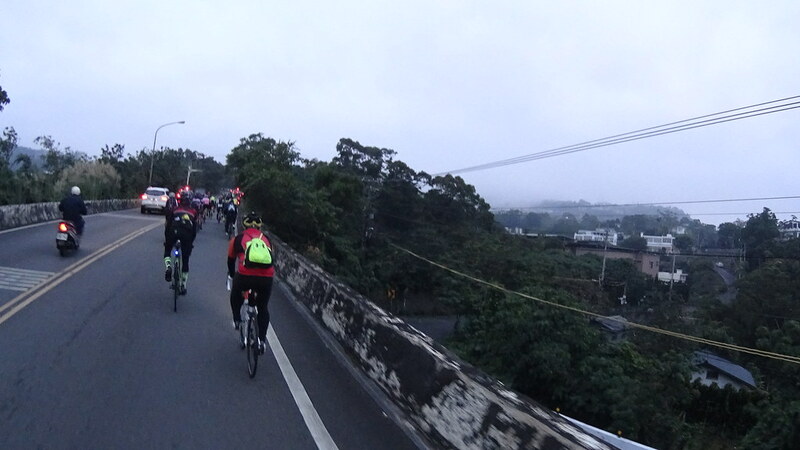 Passing the town, mist started to set in. 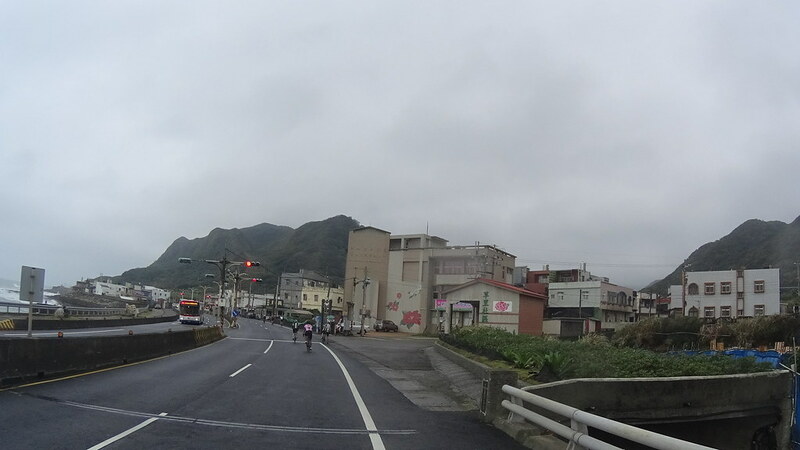 Also the air started to smell like rotten eggs, a sign that we were entering hot spring area. 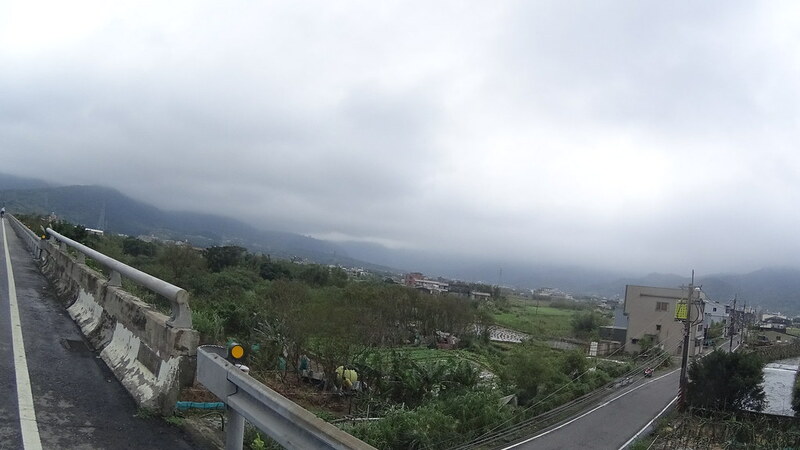 On the far right roadside was the YangMingShan National Park boundary sign. 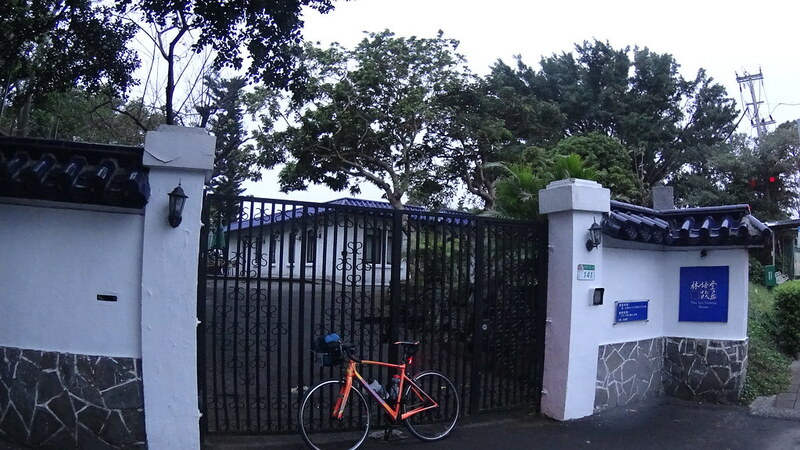 Taipei Teacher Continual Education Center, just next to hot spring area. 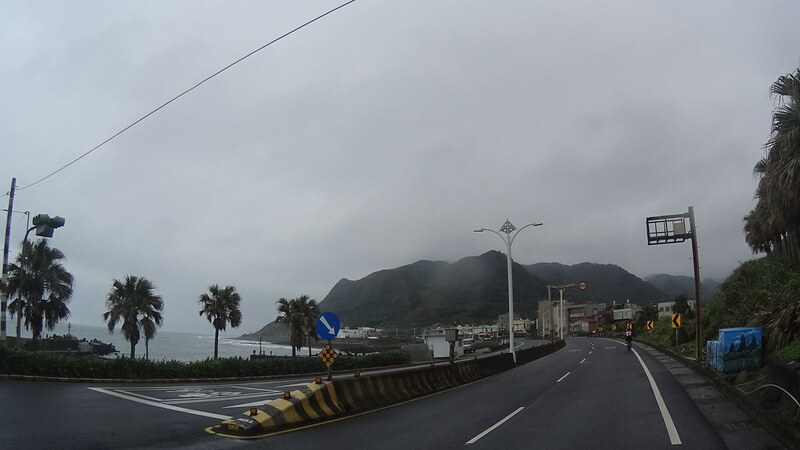 We soon turn left on the road. 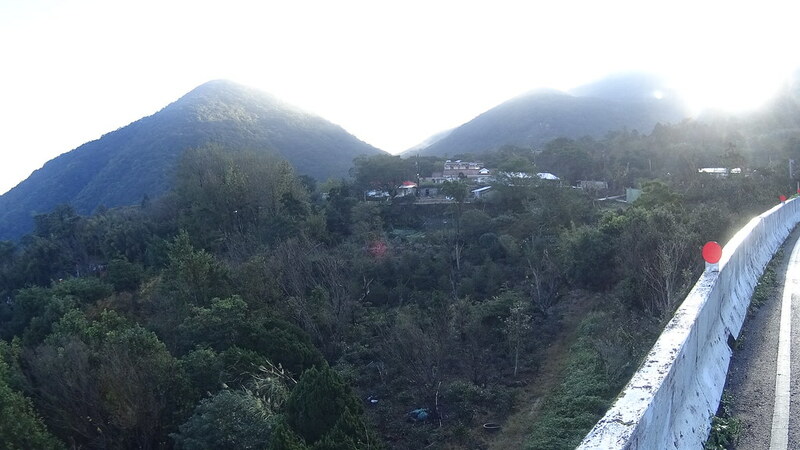 Here buildings started to be replaced by thick forest. 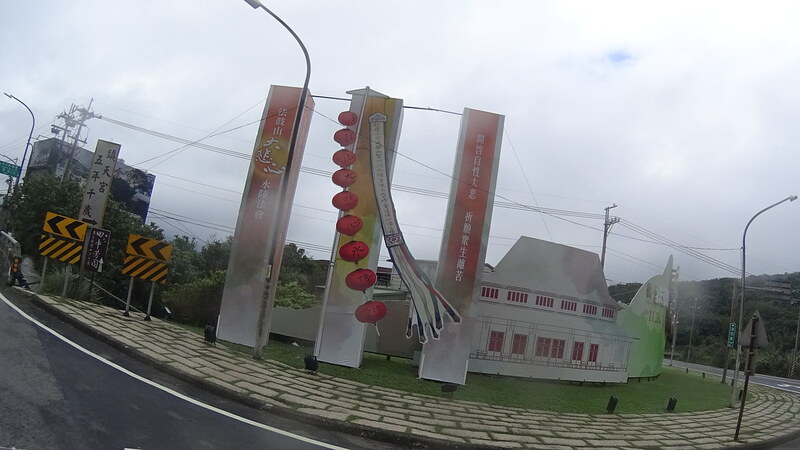 Also here was the main YangMingShan visitor center. 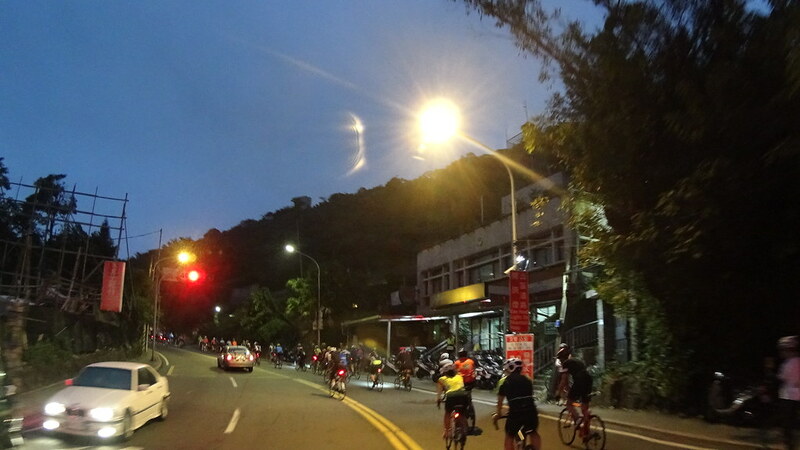 Left road led to Beitou, Taipei’s most famous hot spring area. 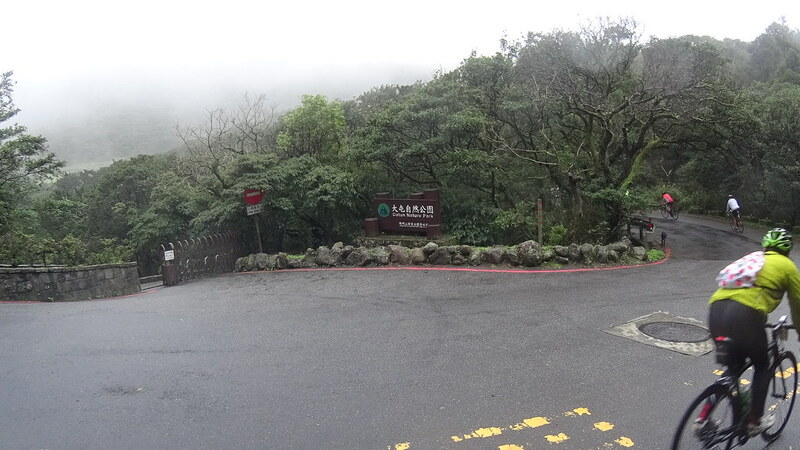 The main park visitor center sign. 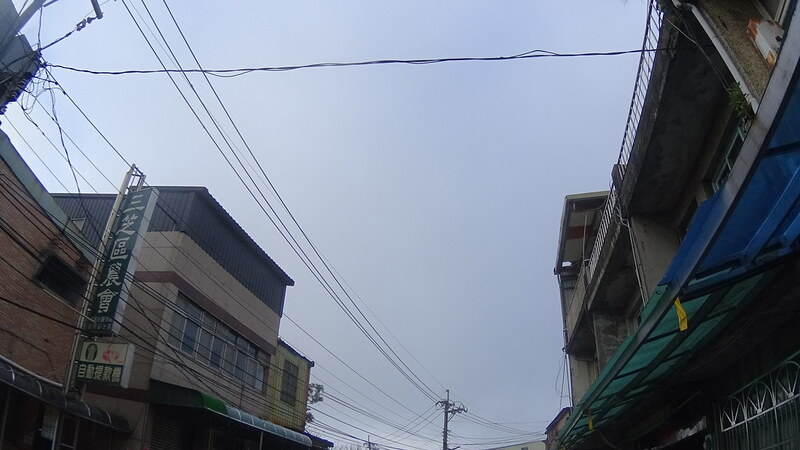 Trees with and without leaves. 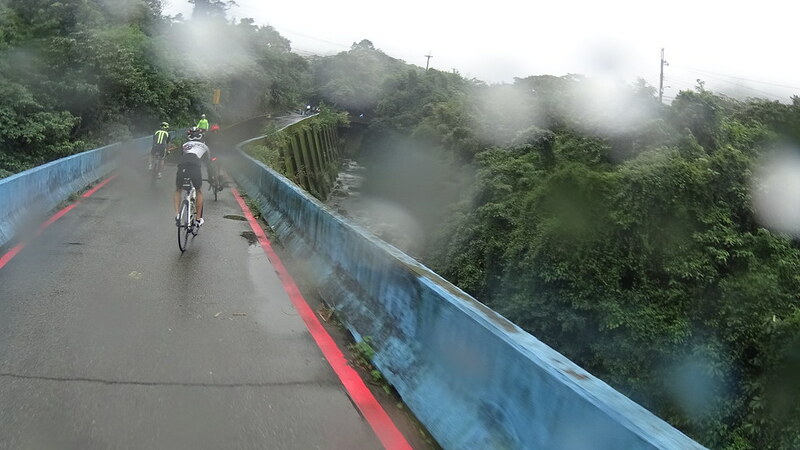 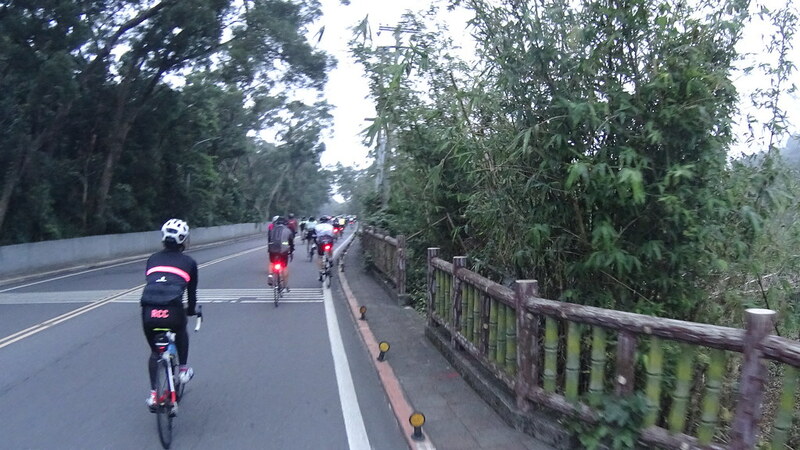 After riding in the forest a little bit the route passed through XiaoYouKeng Bridge (小油坑橋), a bridge below a fumarole. 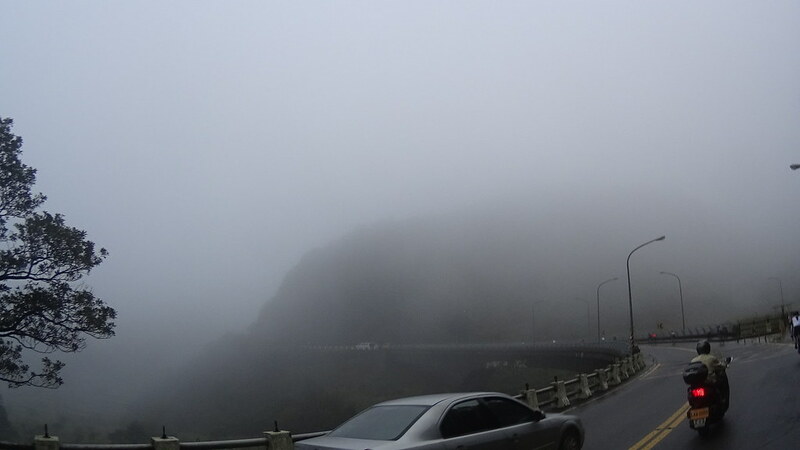 In the mist the fumarole was impossible to see from below. 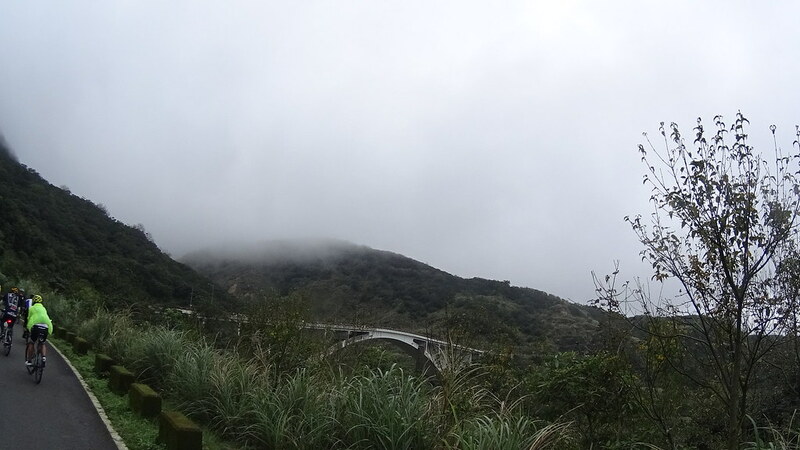 Viewing bridge below the fumarole. 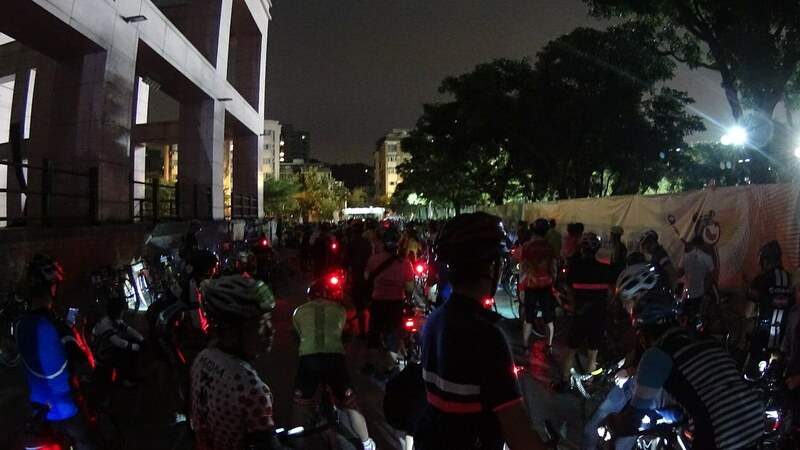 A little bit further away was the route’s first rest stop at the XiaoYouKeng parking lot. 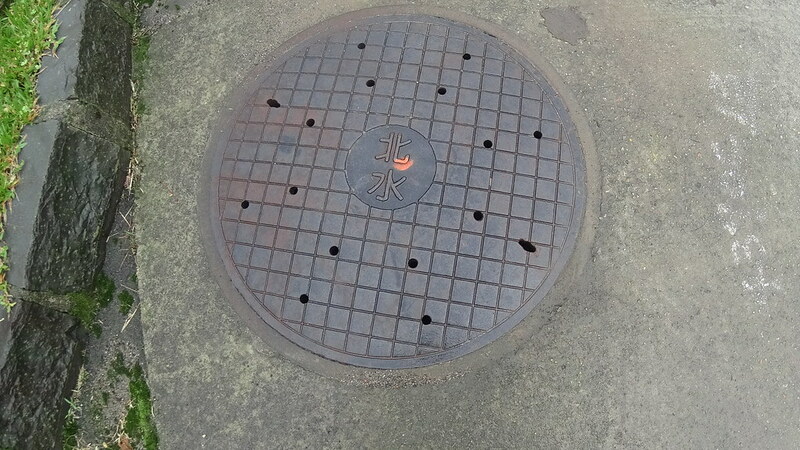 You could constantly hear the steam sound from the drain cover. 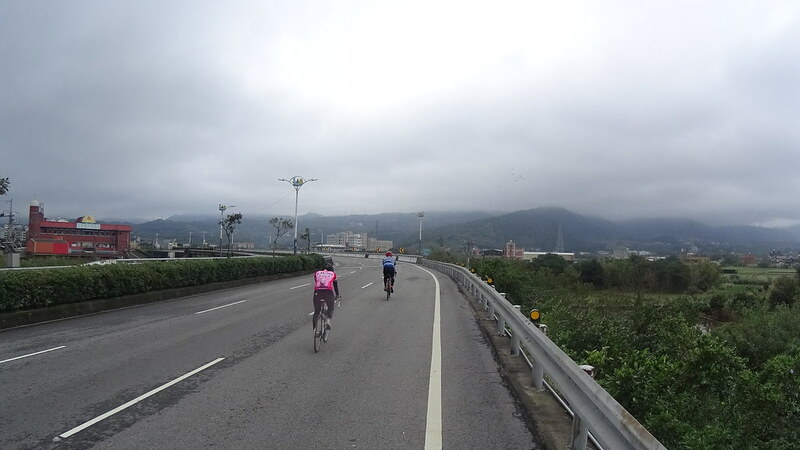 The road we have been riding eventually connected with Route #101. 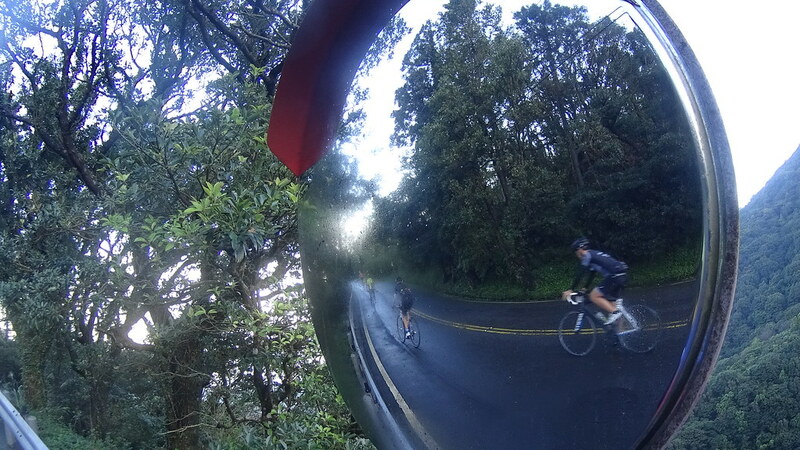 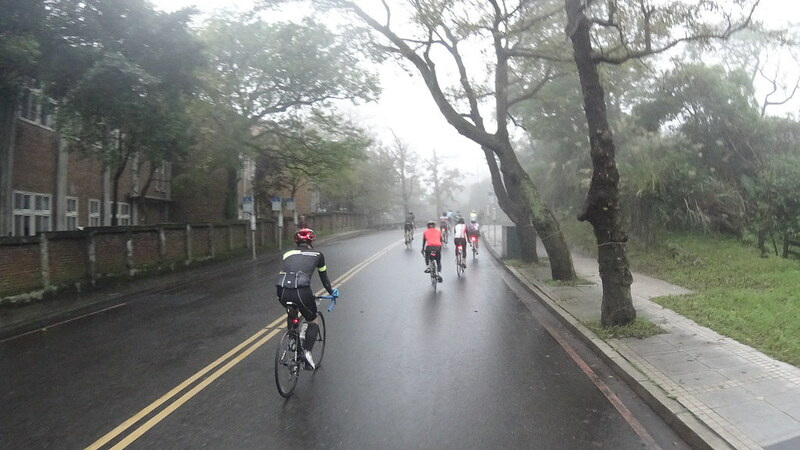 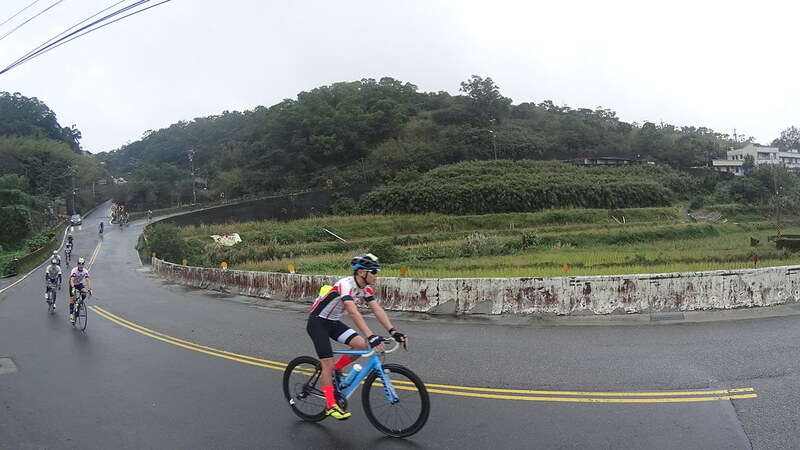 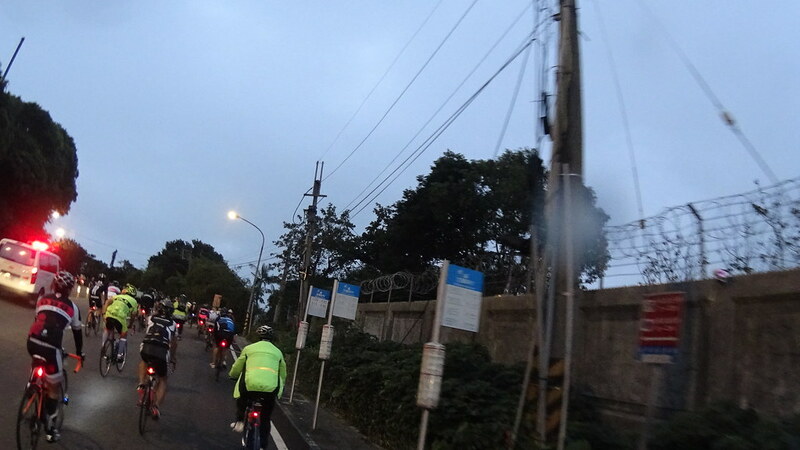 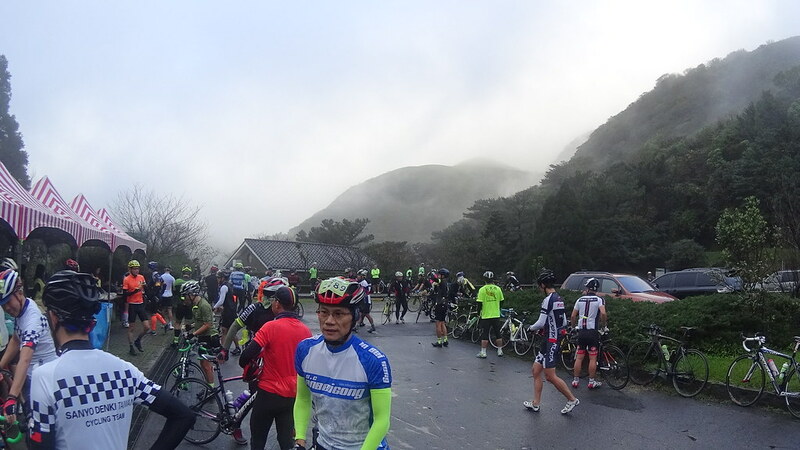 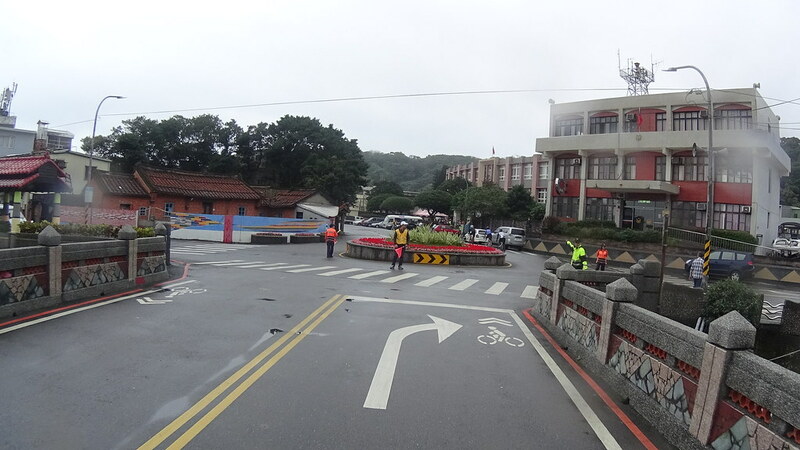 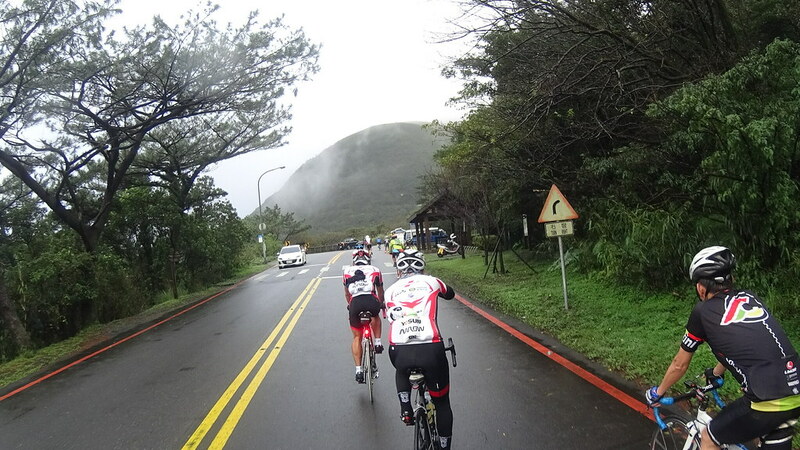 #101 and State #2 Jia together formed a loop around YangMingShan. 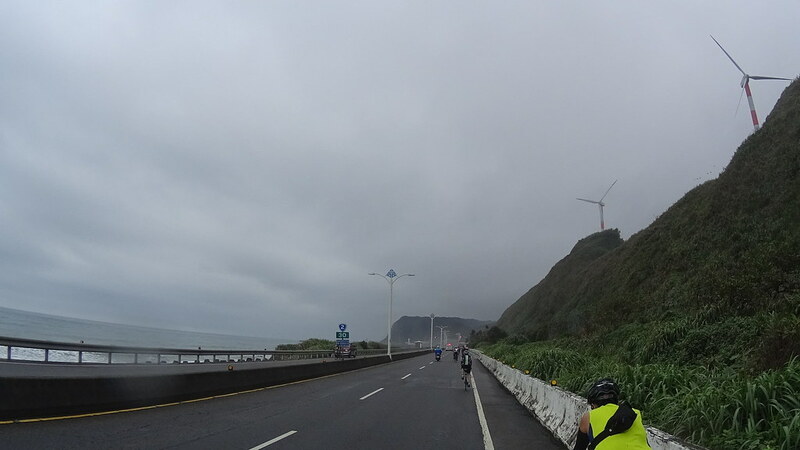 Together with the straight section to Taipei , the entire route was a “P” shape, hence the event name. 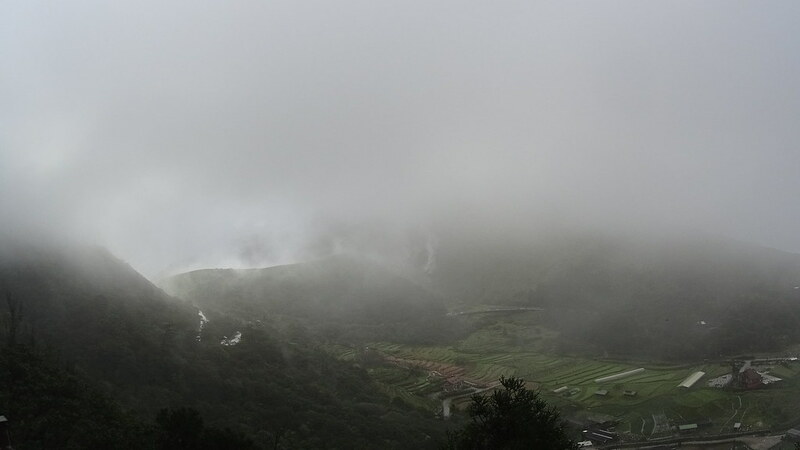 Here you can see unusual, stream-like thick mist going upward at left mountain slope. 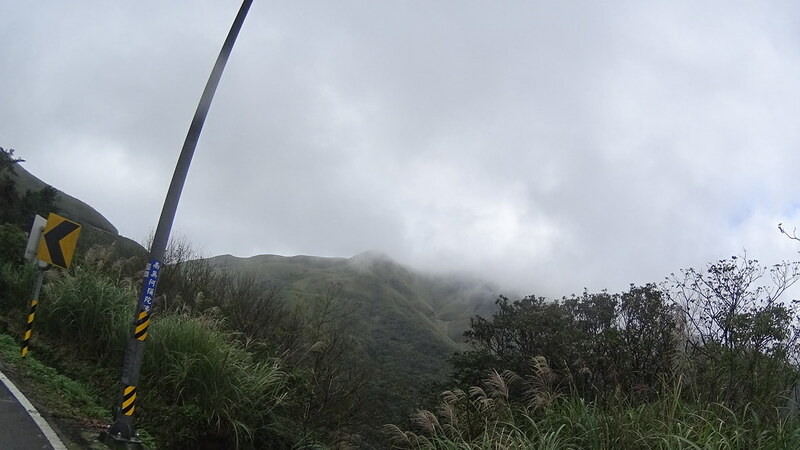 Those were steams coming out of the fumarole. 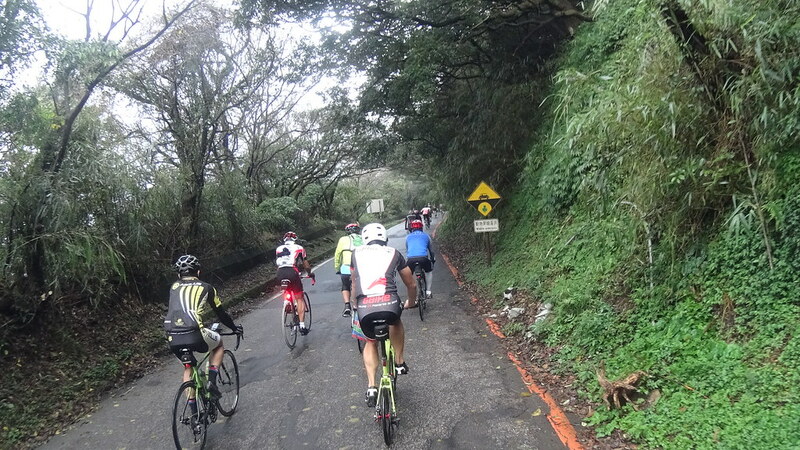 Stray dogs. 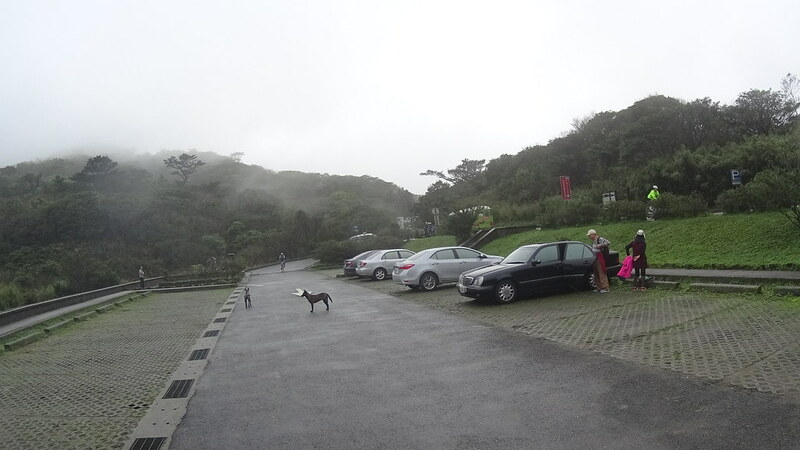 They were very common in YangMingShan area, quite unusual for a national park. 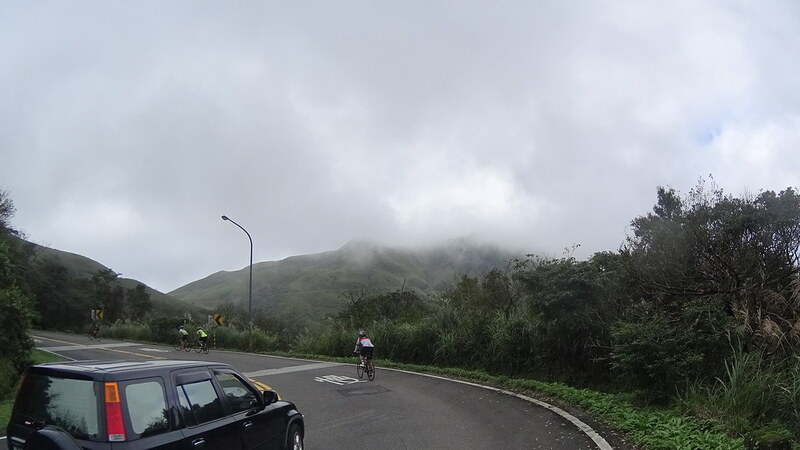 Continued going up, we finally reached the highest point at the left side of YangMingShan loop: ErZiPing Visitor Center (二子坪), a dip between two peaks. 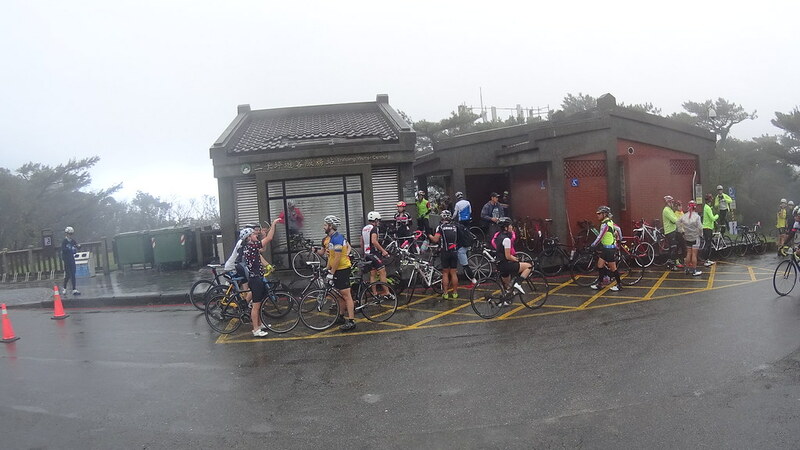 Trail head to Mt. 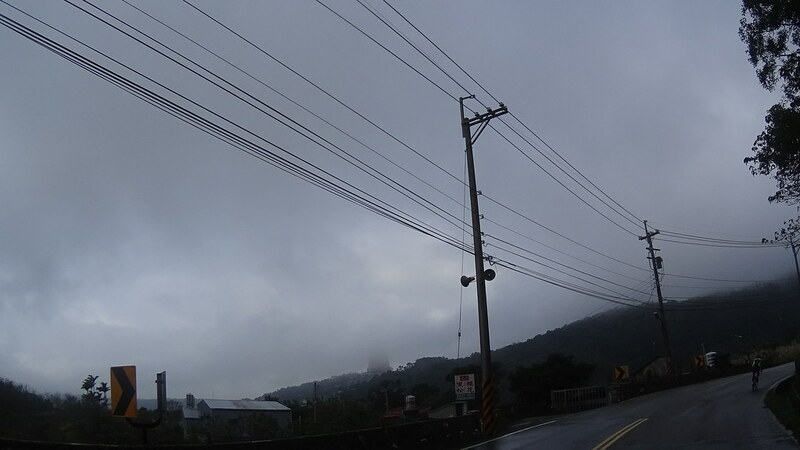 DaTun (大屯山), one of the two peaks. 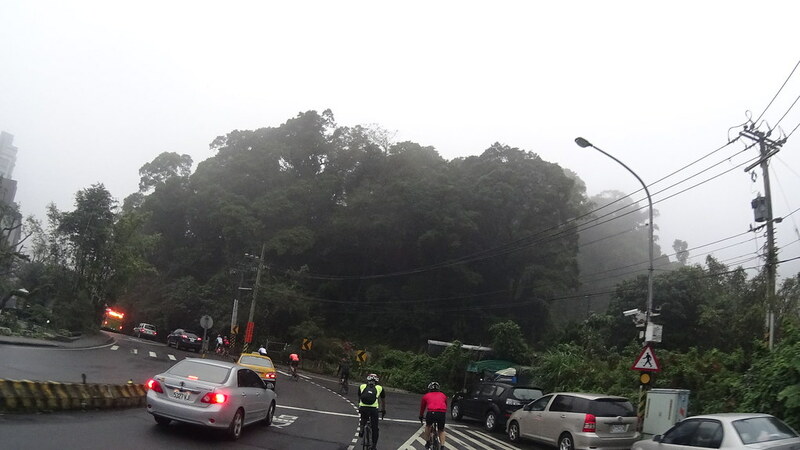 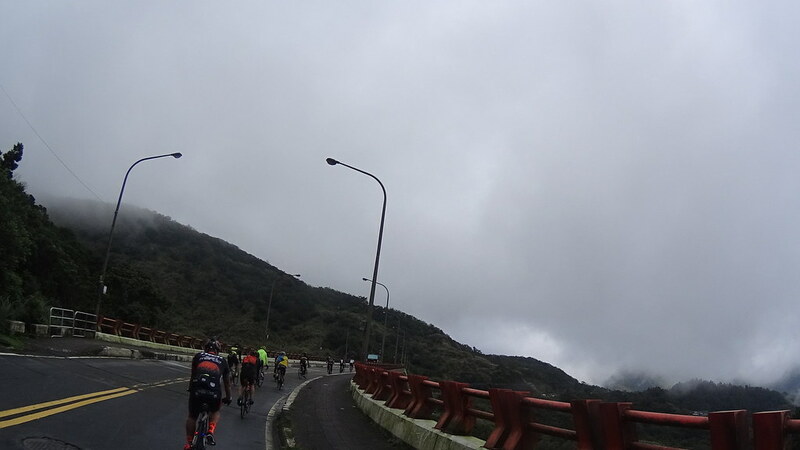 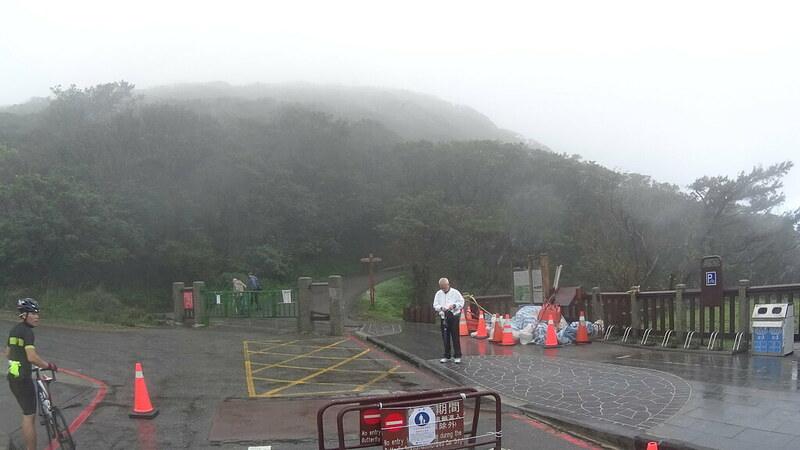 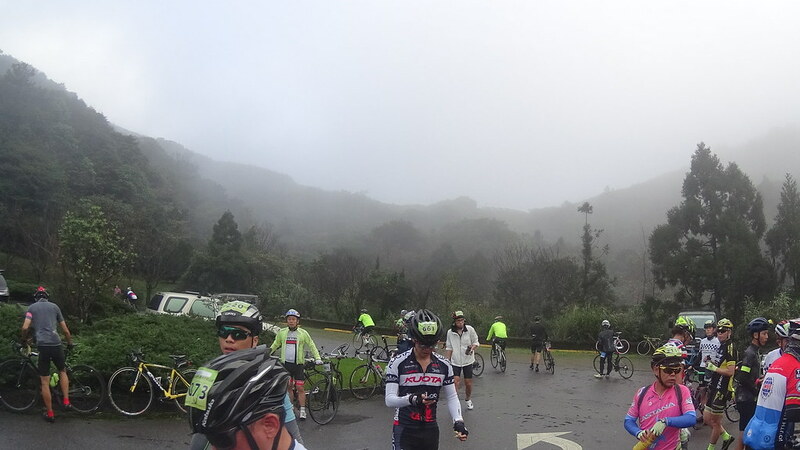 Here we started the great descend down to the northern part of YangMingShan. 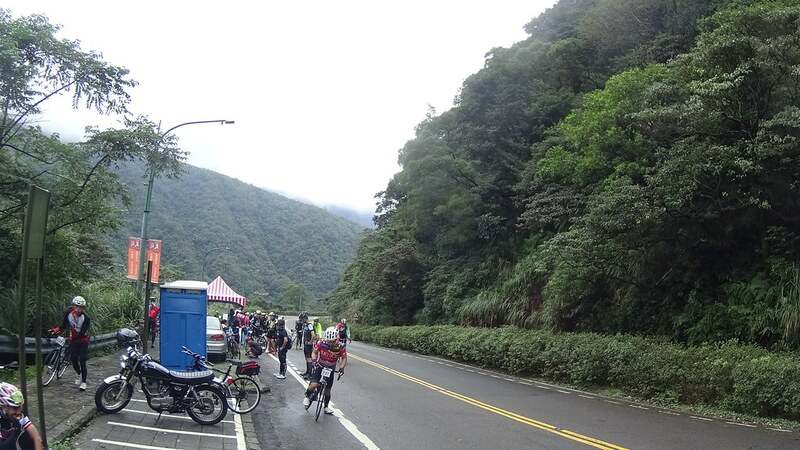 DaTun Natural Park, another rest area. 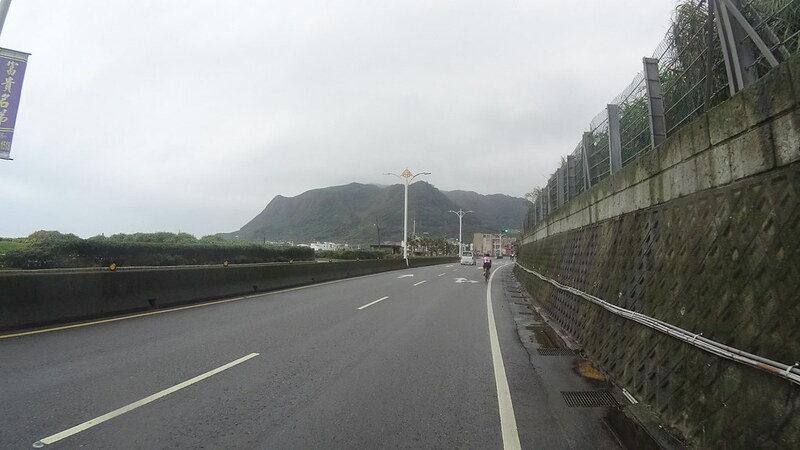 The many cone-shape peaks of YangMingShan. 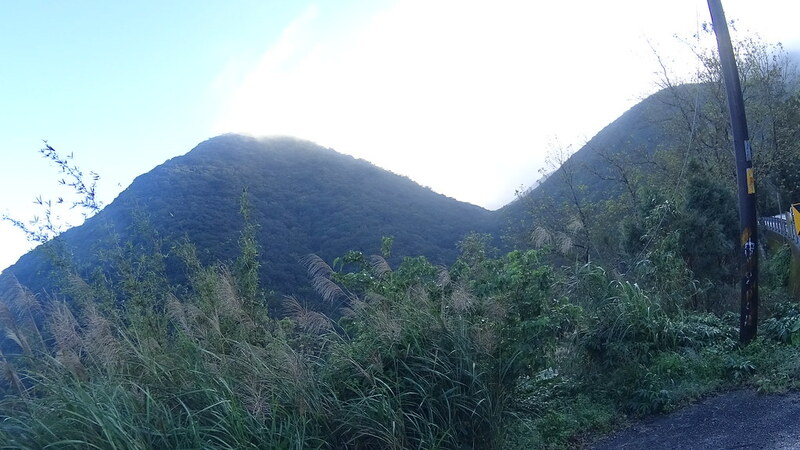 Looking back at the dip where we came from. 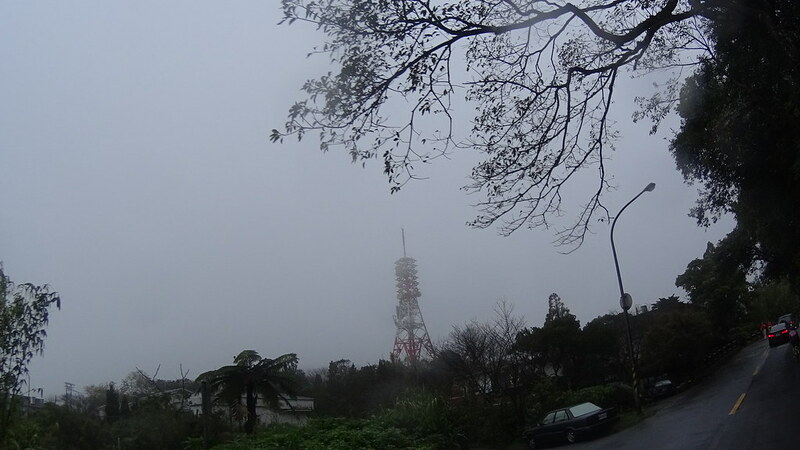 What was that tall building in the mist? 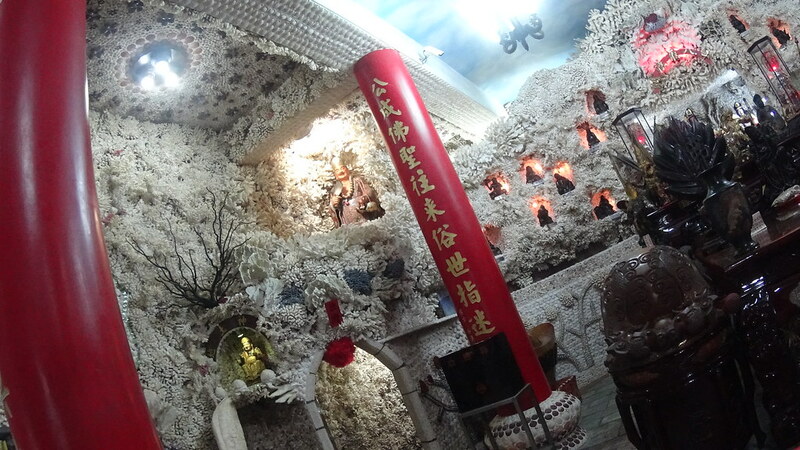 It turned out that there were three big cemetery complex in this area, even of different religions. 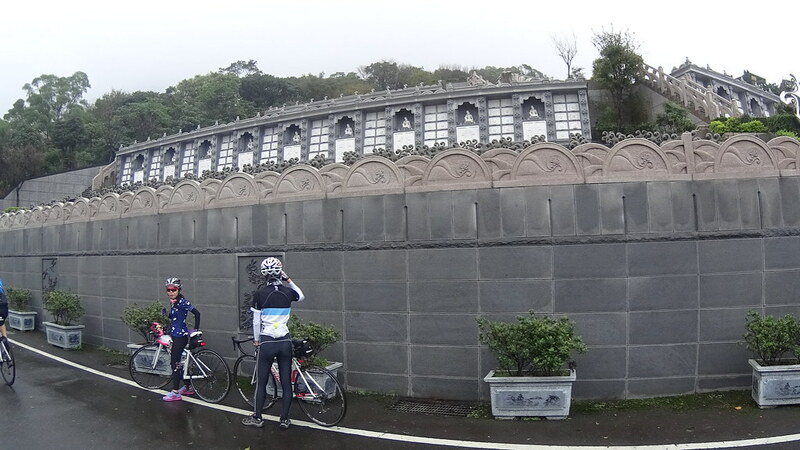 Throughout the northern part of YangMingShan there were many such cemeteries along the route. 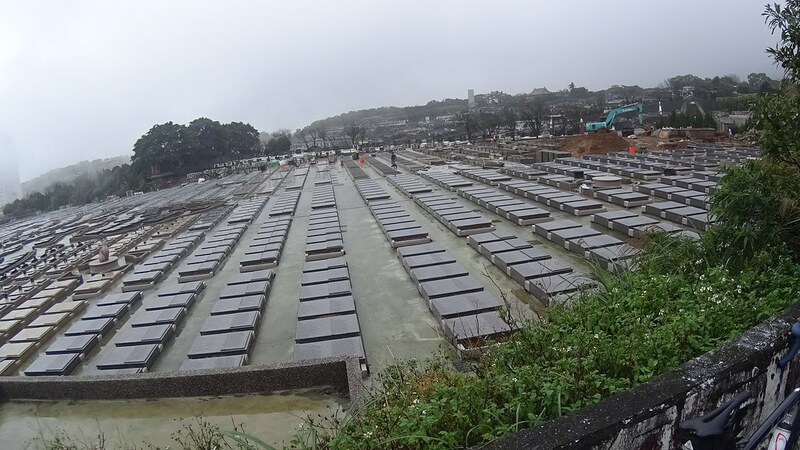 Another cemetery to your right! 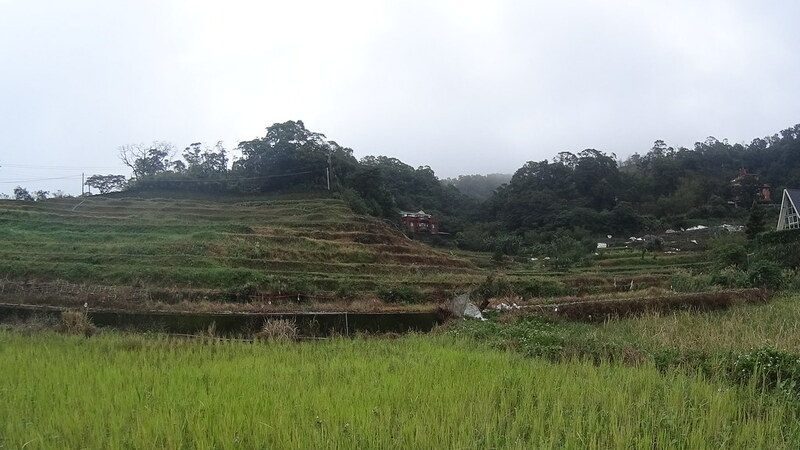 Also along the northern part of YangMingShan was terraces, agricultural lands built like stairs. 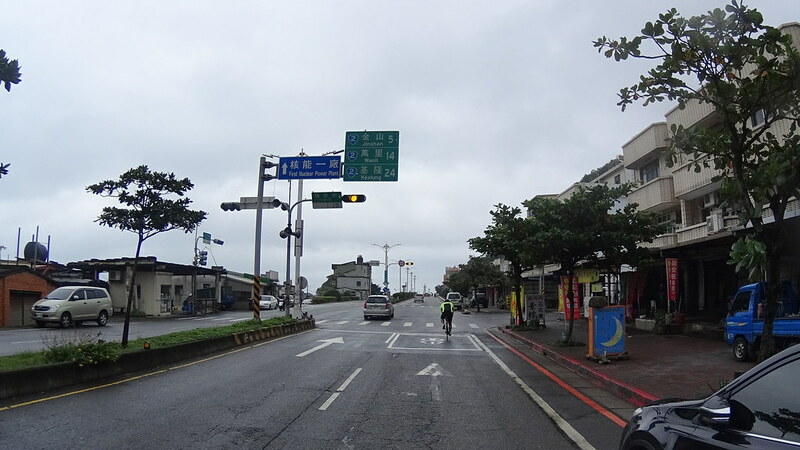 If we continued on Route #101 we would get to SanZhi’s downtown area. 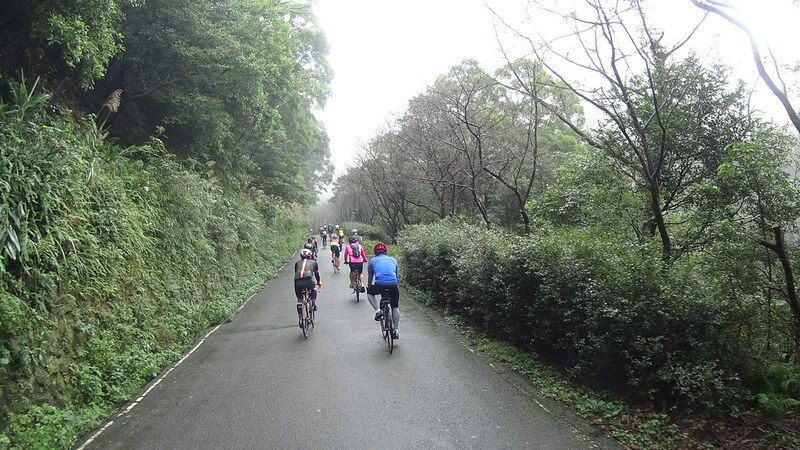 Instead we took a sharp right and onto the QingXi local road. 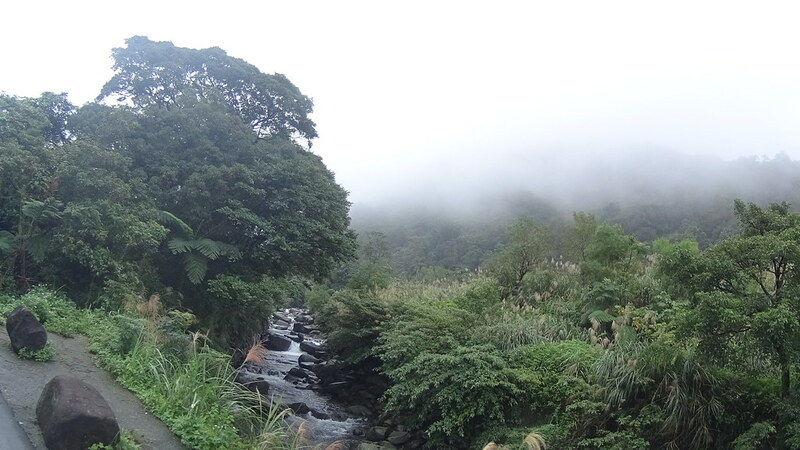 Abundant rainfall created lots of small creeks here. 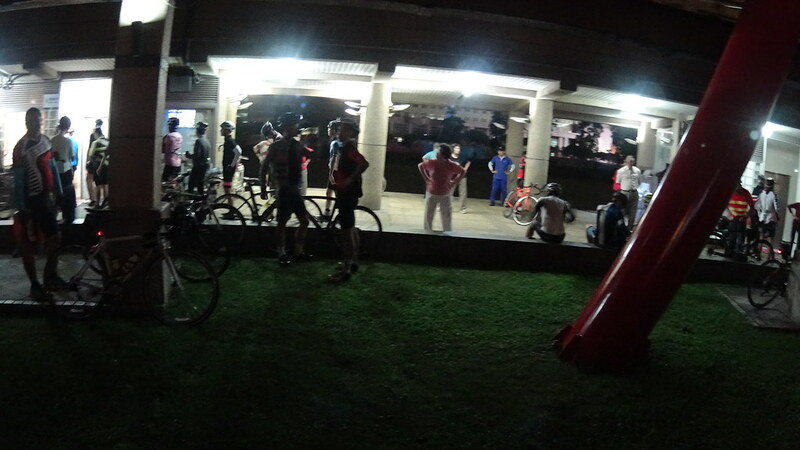 After some climb we reached our second rest stop… just next to a big public cemetery! 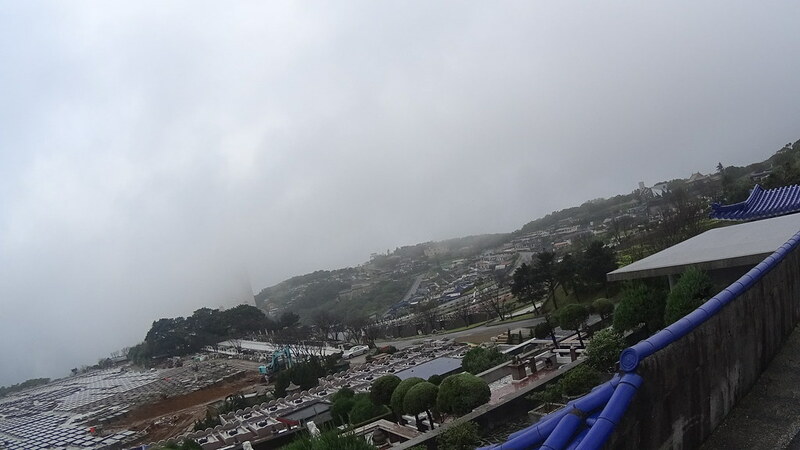 The cemetery. 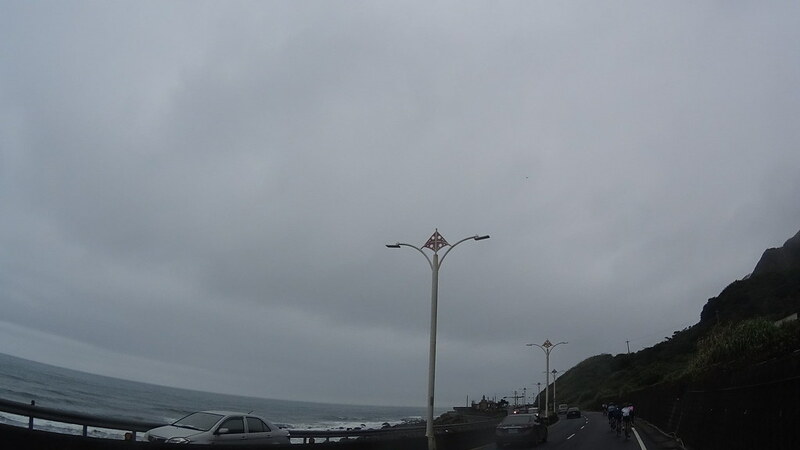 I just had a great idea of going green: put solar panels on them! 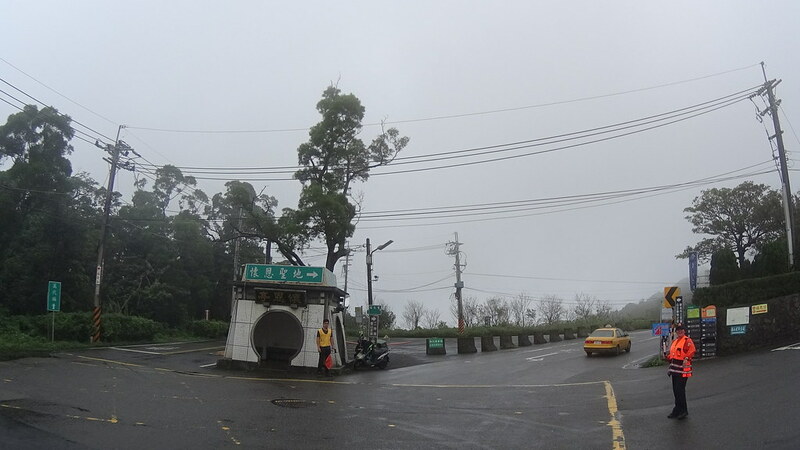 Both the living and the dead shared parts of YangMingShan. 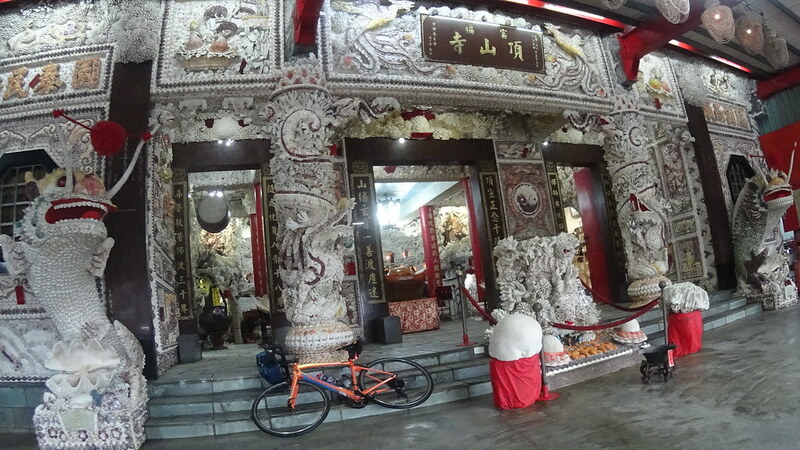 I found an interesting temple not far away from the cemetery rest stop when planing for the ride. 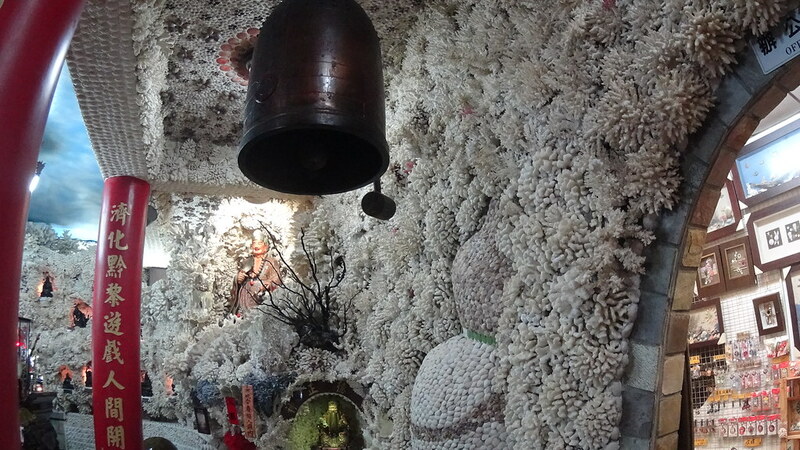 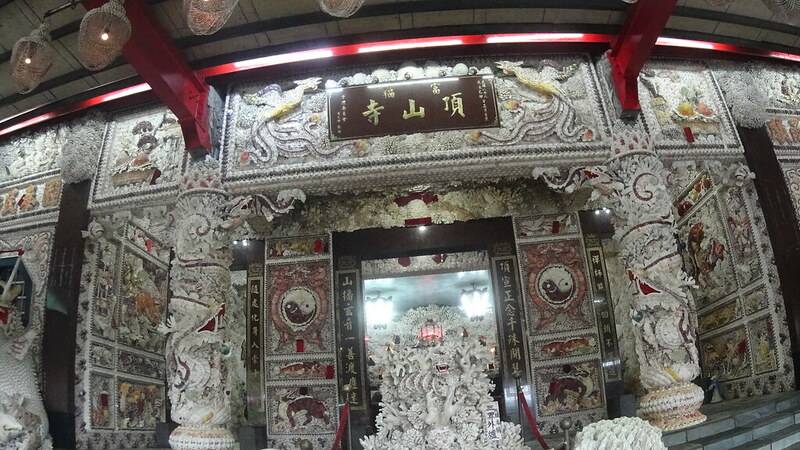 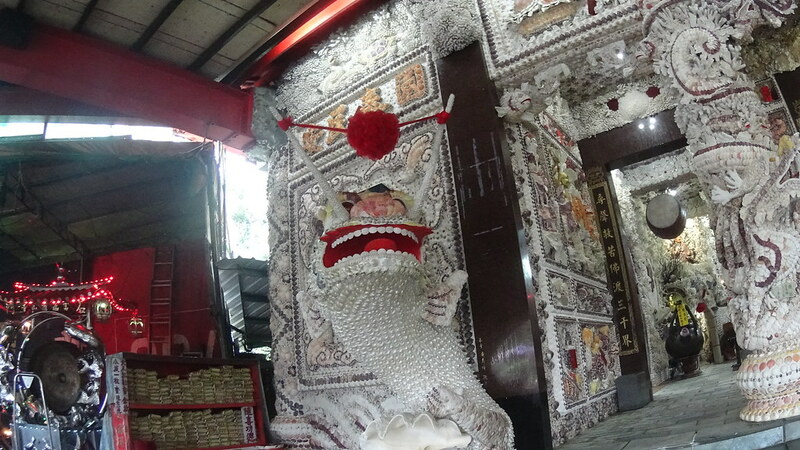 It was called “the Seashells Temple (三義貝殼廟)”, a temple whose interior was made by seashells. 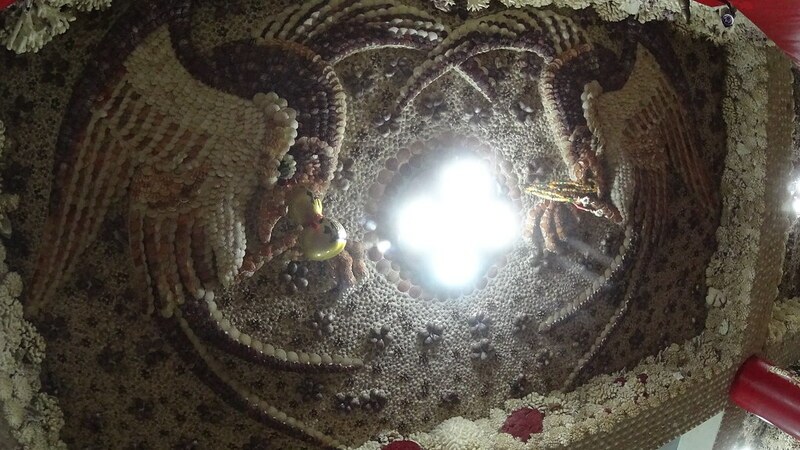 Here the dead was brought back to life via arts and people’s will. 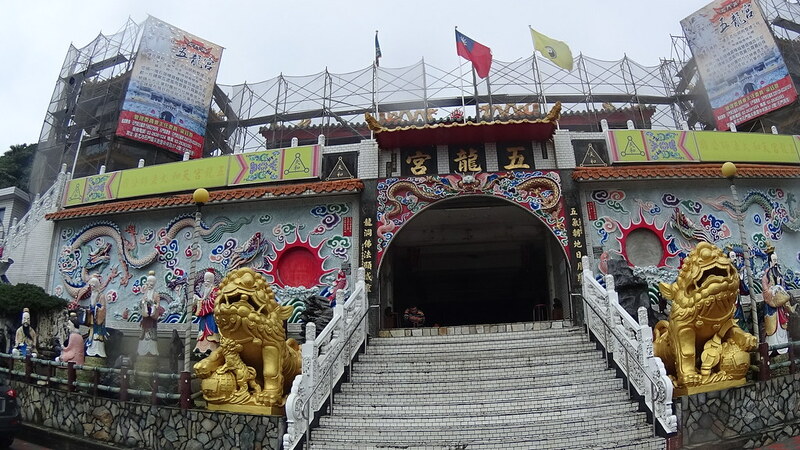 The temple’s exterior looked just like a warehouse. 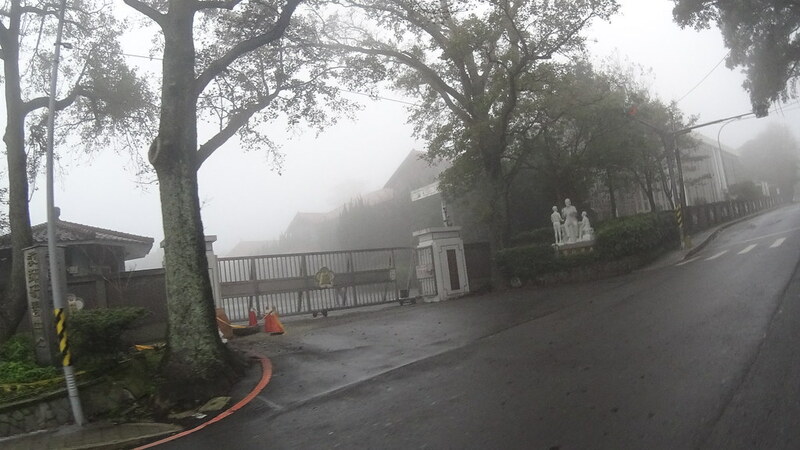 Here was the entrance. 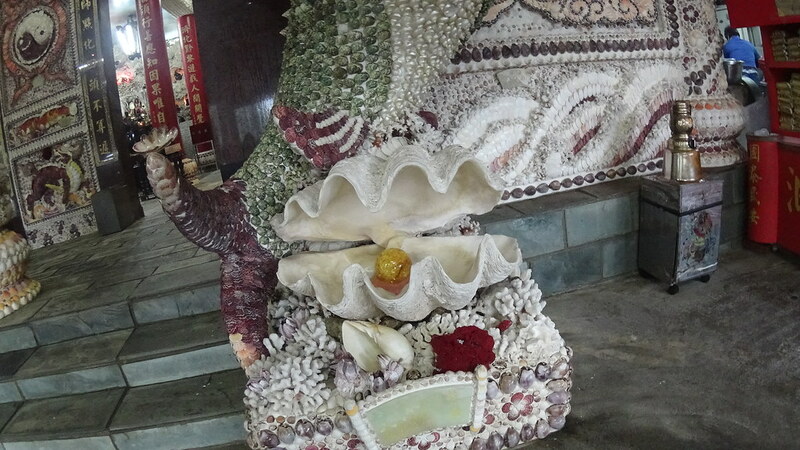 Normal temple painting was all replaced by seashells. 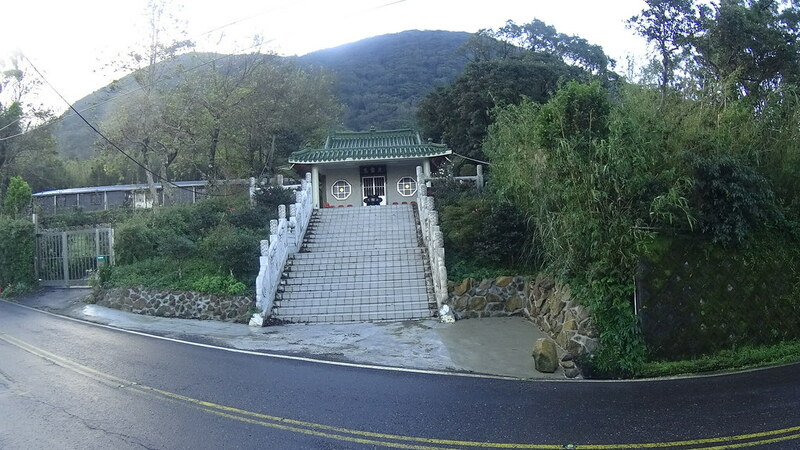 After visiting the Seashell Temple I got back to course. 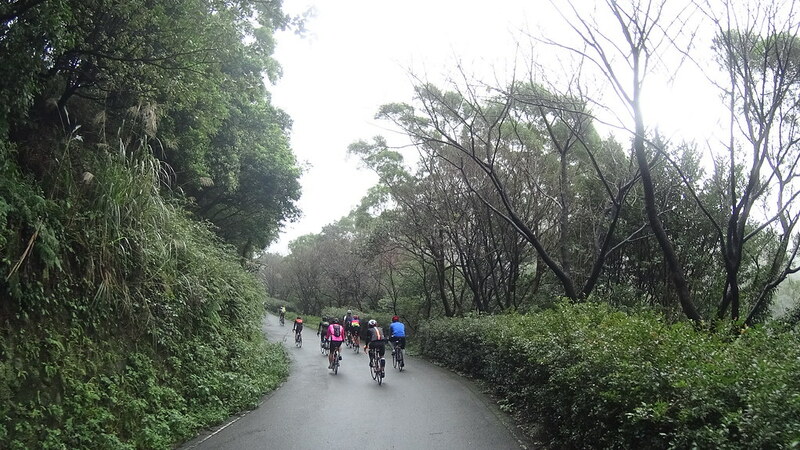 The course descended for a while and before hitting the shore, again got onto even rural local roads and ascended. 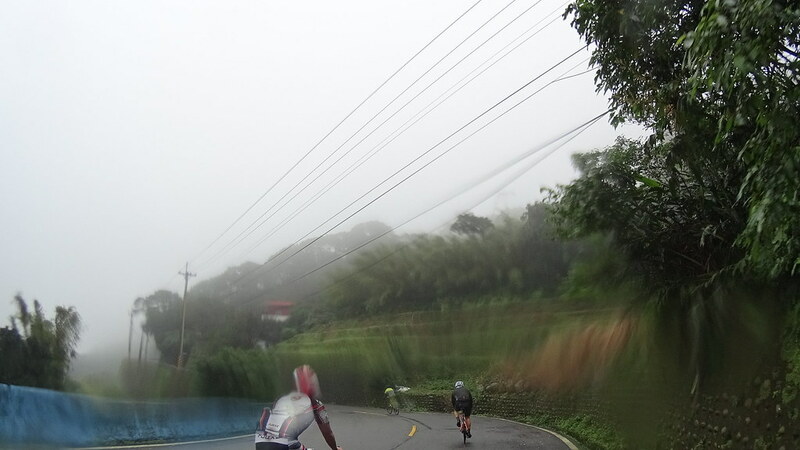 It started raining around here, making the lens a bit blur. 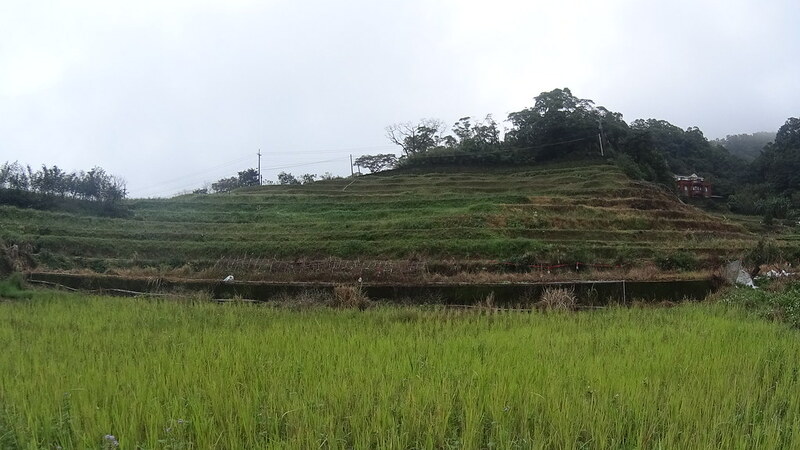 Another type of terraces. 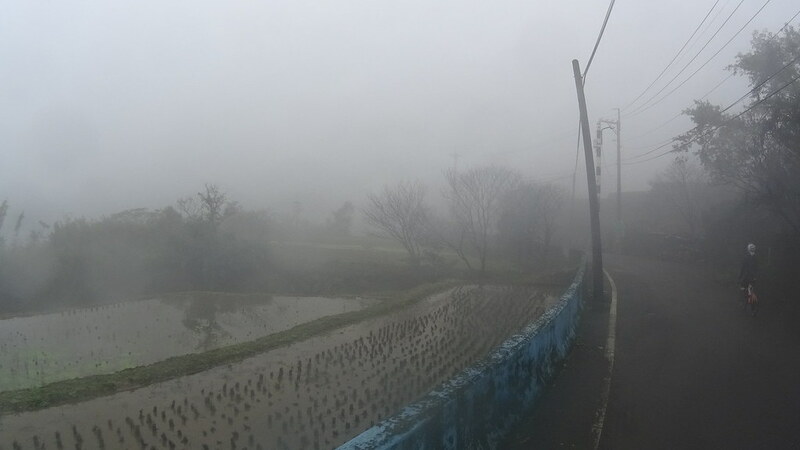 This time it was wet for growing rice. 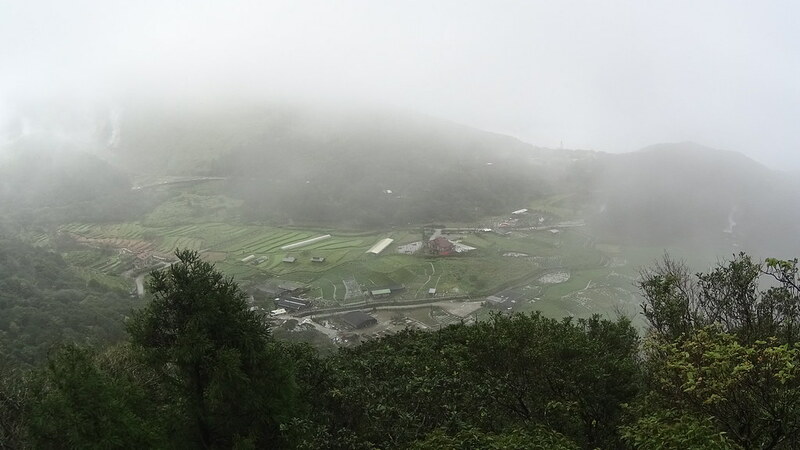 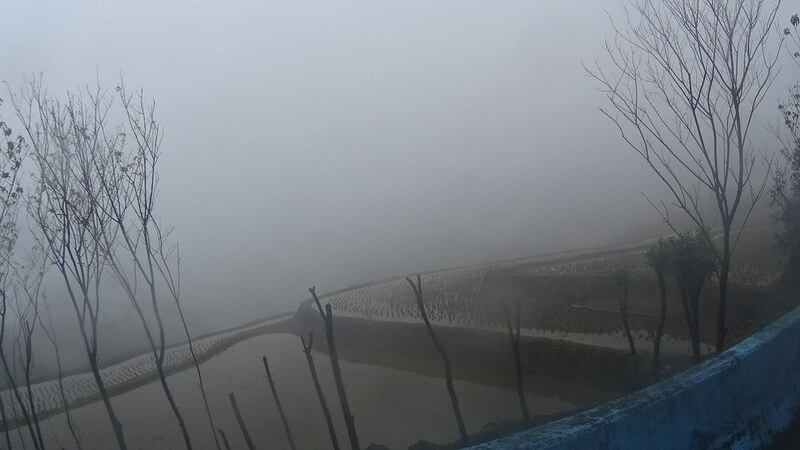 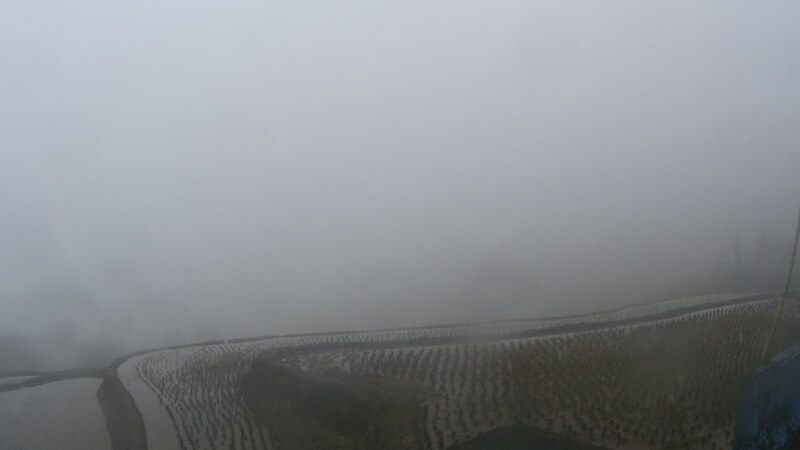 Rain, mist and rice terraces. 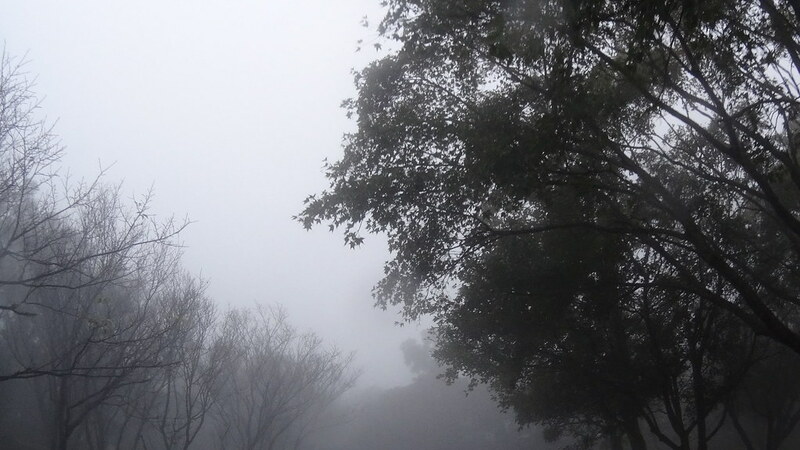 Very mystic. 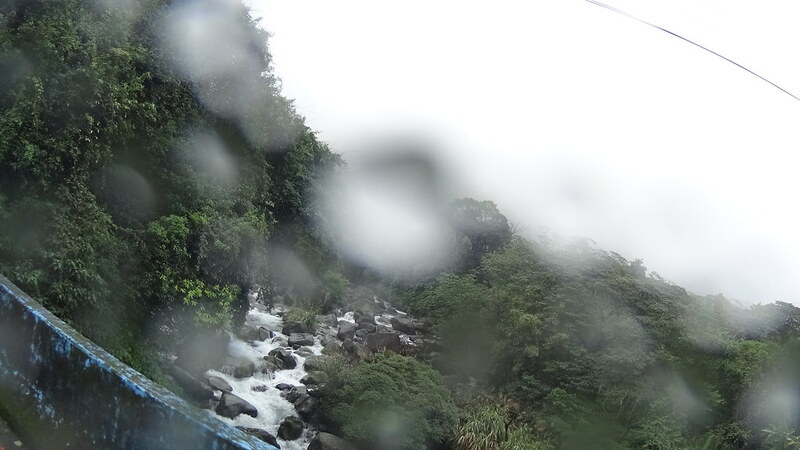 Interesting natural image distortion by water on the lens. 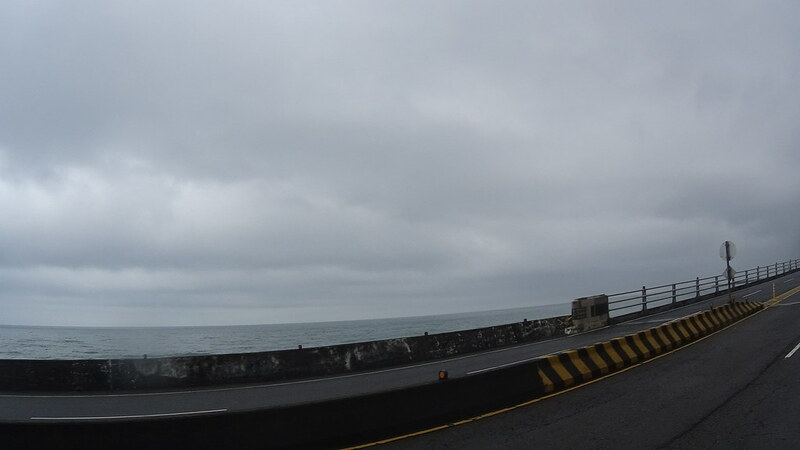 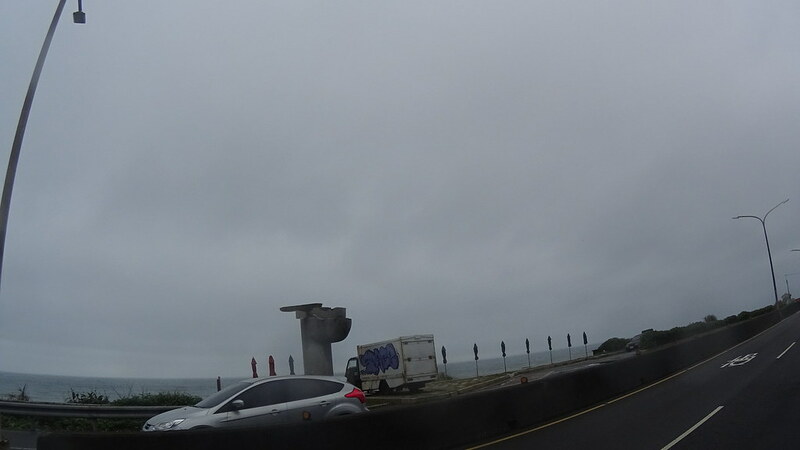 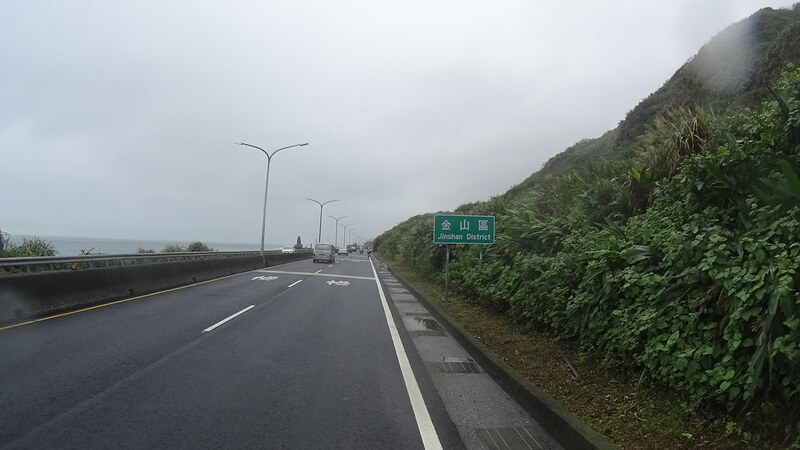 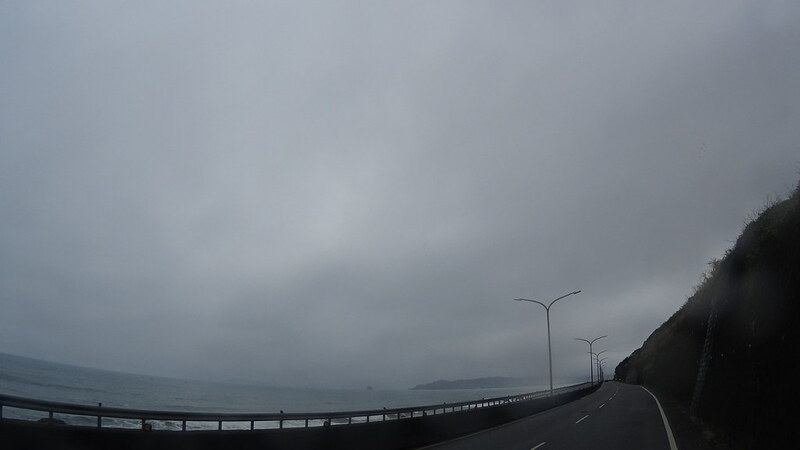 After battling through a steep hill, the road connected back to Route 101 and we started heading toward the shore city Shimen (石門). 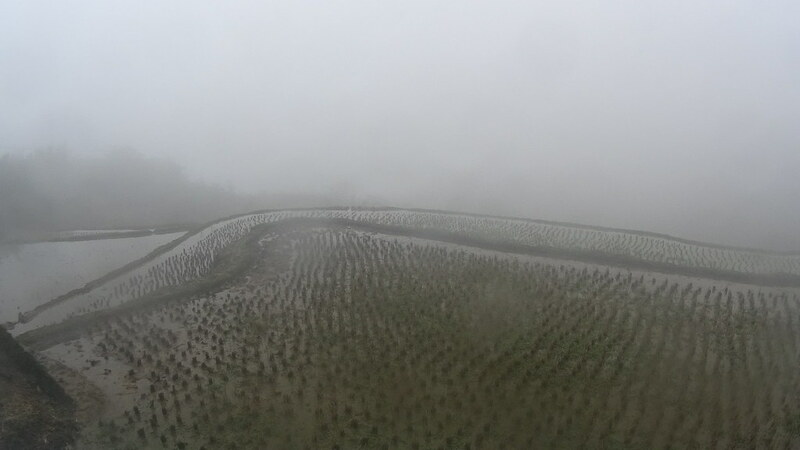 Descending through Miscanthus fields . 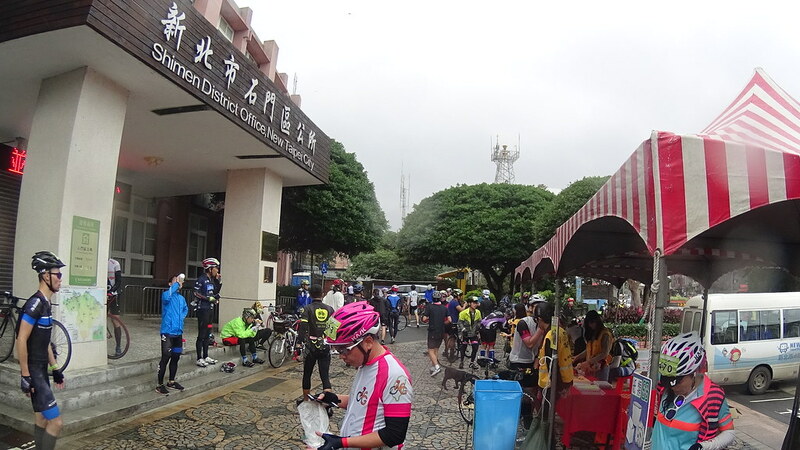 Here we had our 3rd rest stop at the town’s office, before we tacking 13km of shore road. 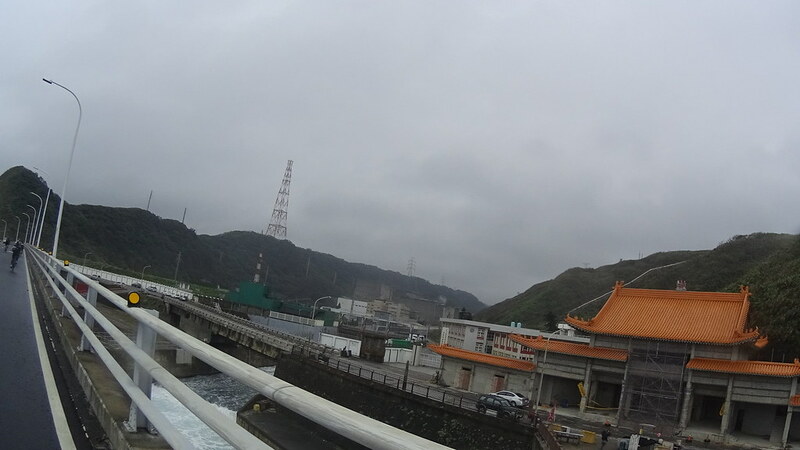 Heading toward the First Nuclear Plant! 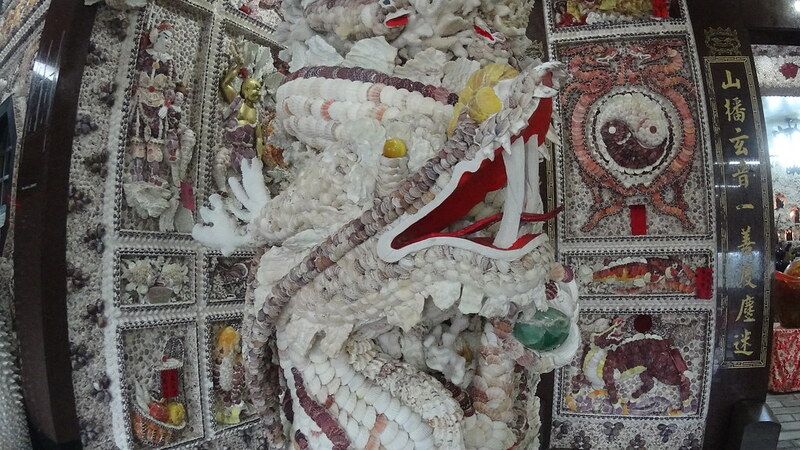 It said “Five Dragon (Sea) Palace”. 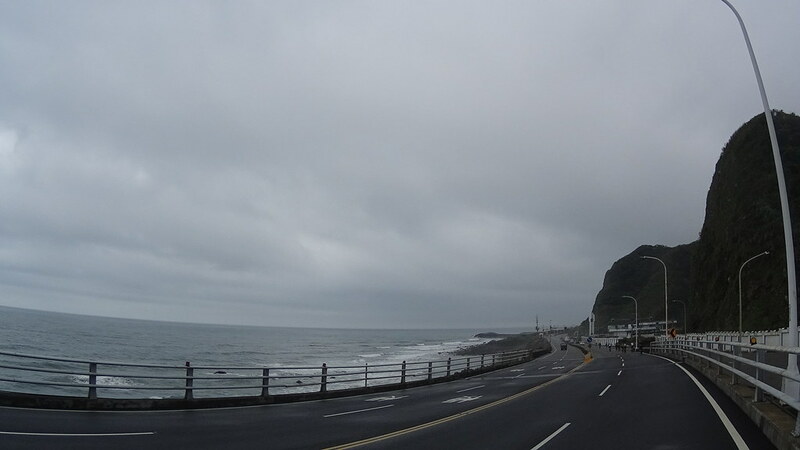 Along the shore road was the First Nuclear Power Plant situated at a valley. 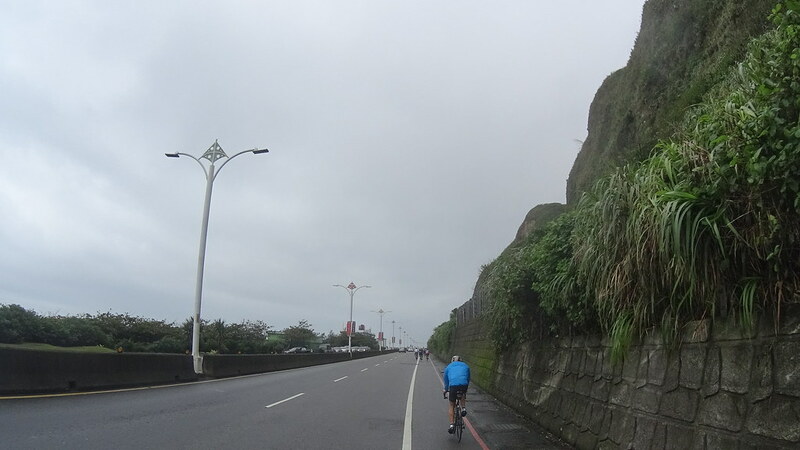 Here near the north east part of Taiwan shore, the mountain slopes went directly into the sea, creating magnificent landscapes. 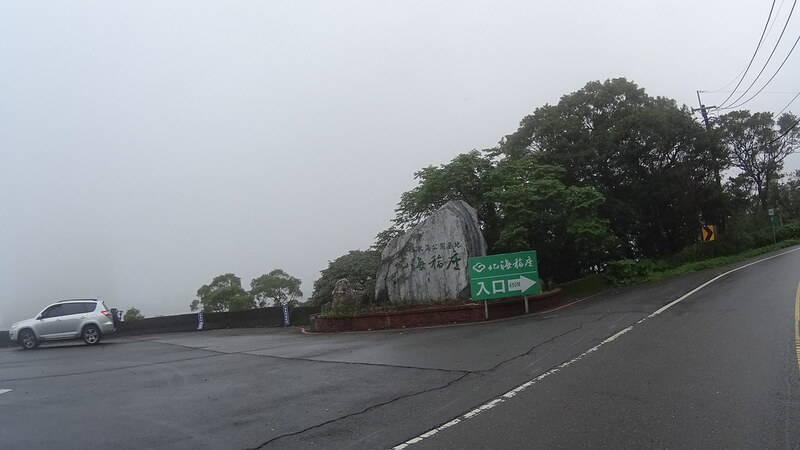 Soon we would enter JinShan District (金山) and head back to YangMingShan. 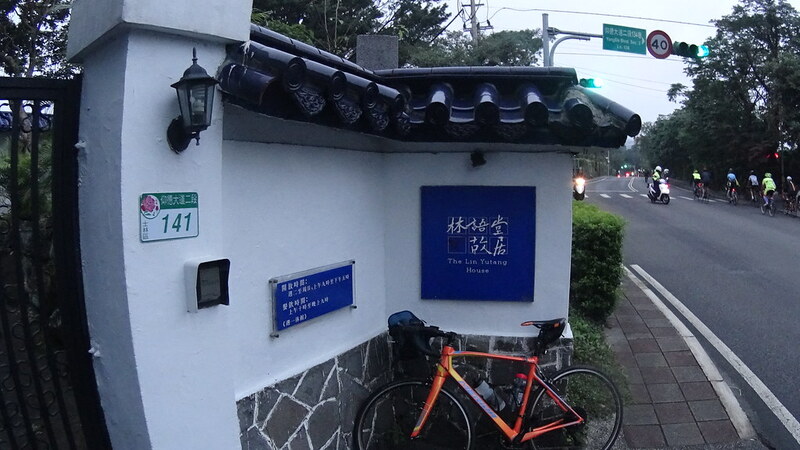 It said “Taiwan North Shore Art Association”. 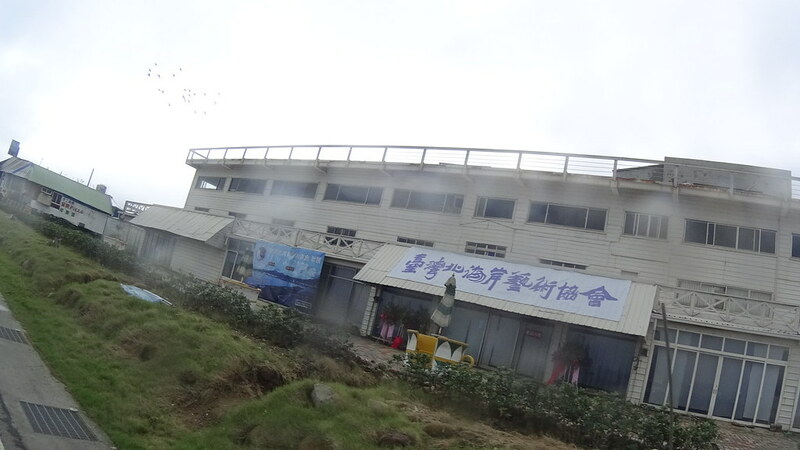 Same as Kenting, traces of abandoned buildings from over-development could be seen in JinShan. 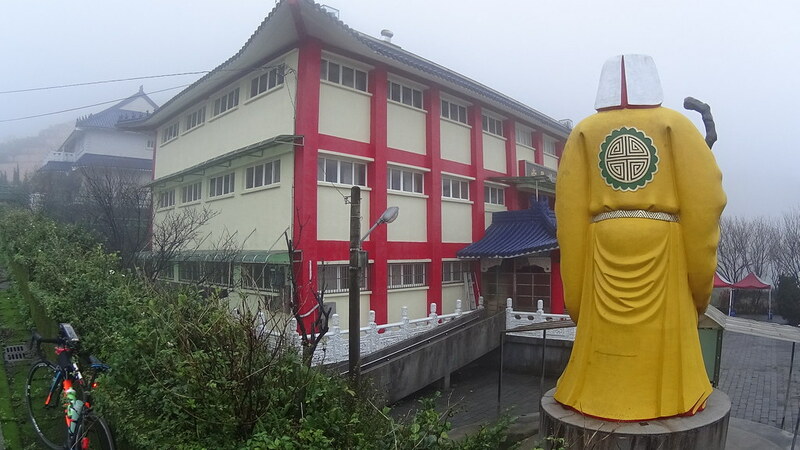 Dharma Drum Mountain (法鼓山) sign, one of the most famous Buddhist temples in Taiwan. 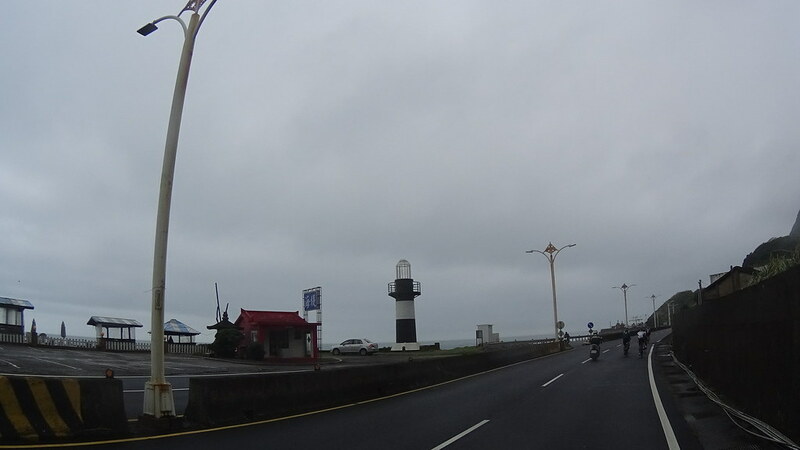 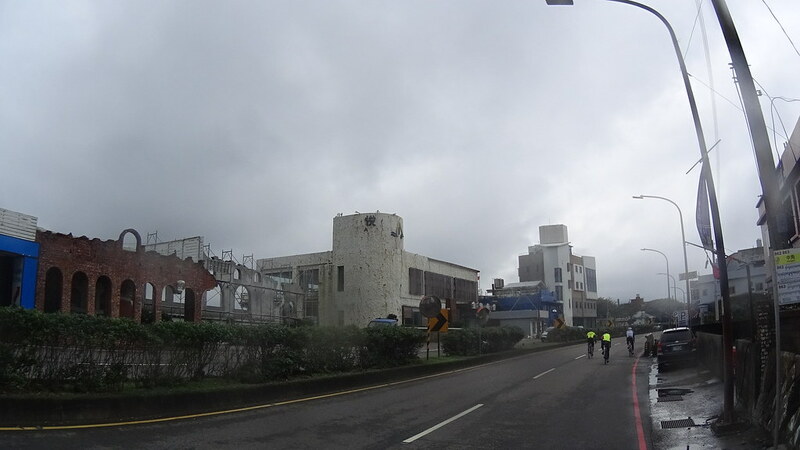 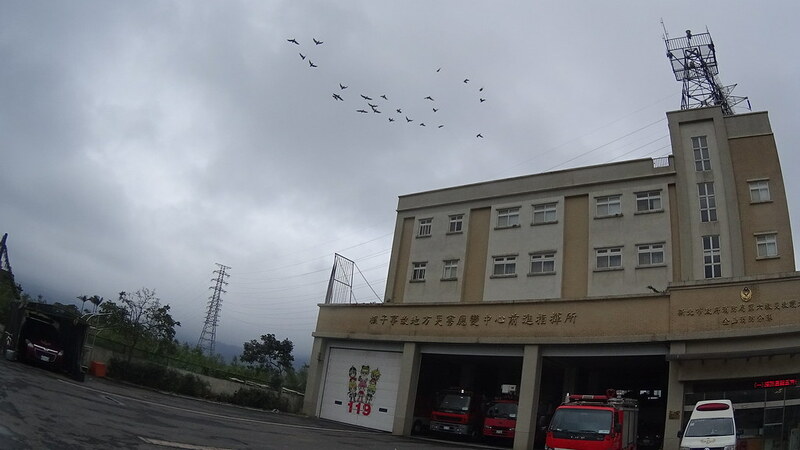 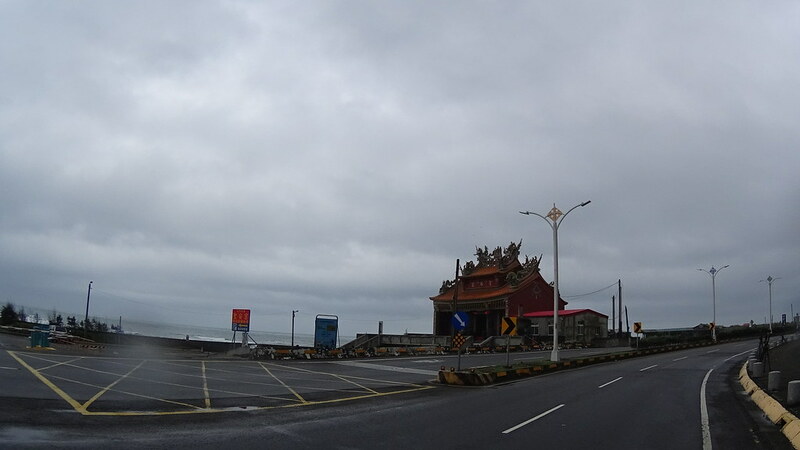 “Nuclear Disaster Local Command Center” building at the intersection of State #2 (the road along the shore) and State #2 Jia (the road heading to YangMingShan). 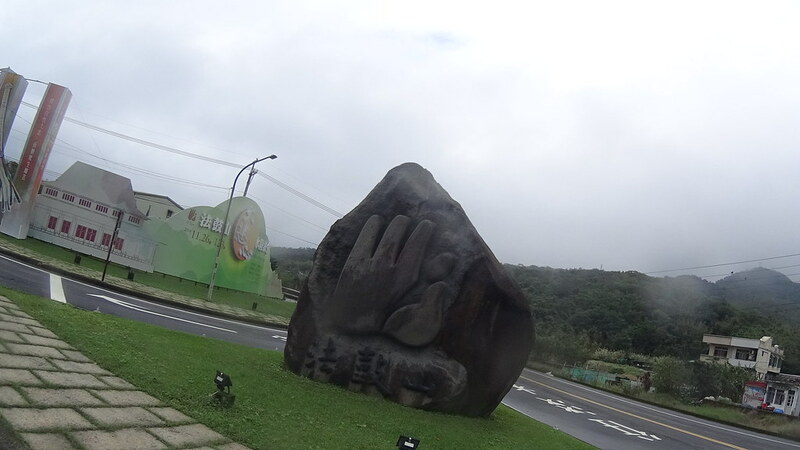 A yam statue. 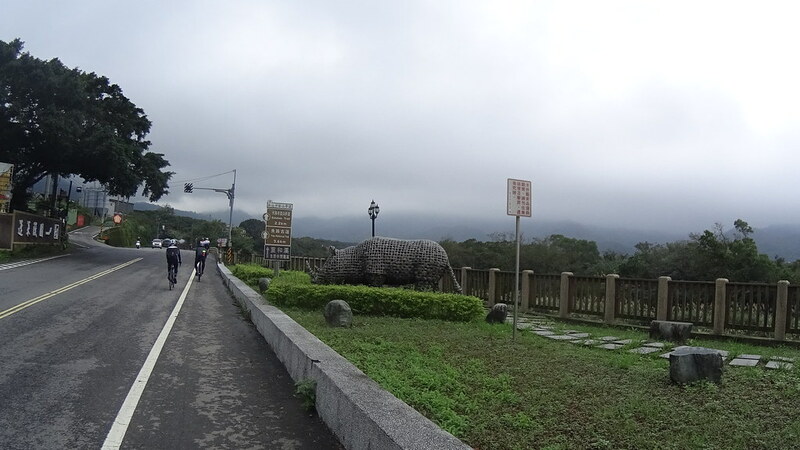 JinShan is famous for its yam. 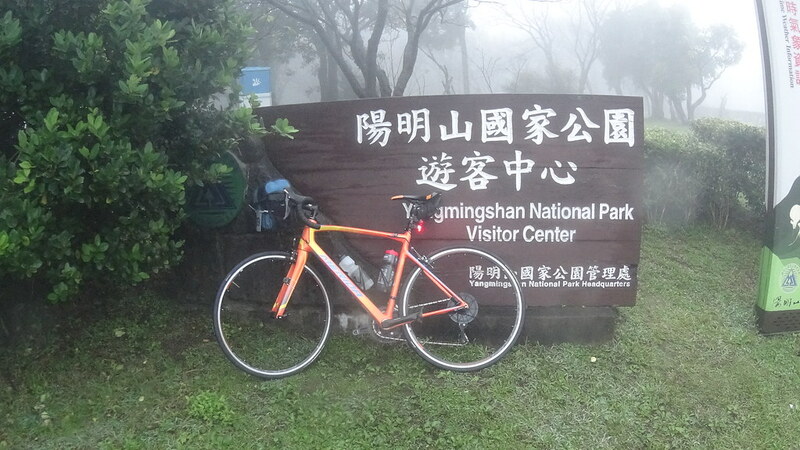 At YangMingShan’s park boundary sign here we had the last rest stop. 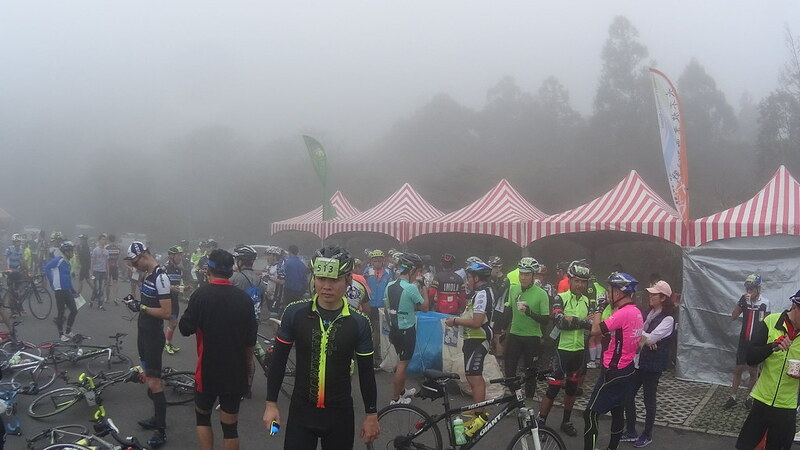 Prepare for tacking the second major climb in this event. 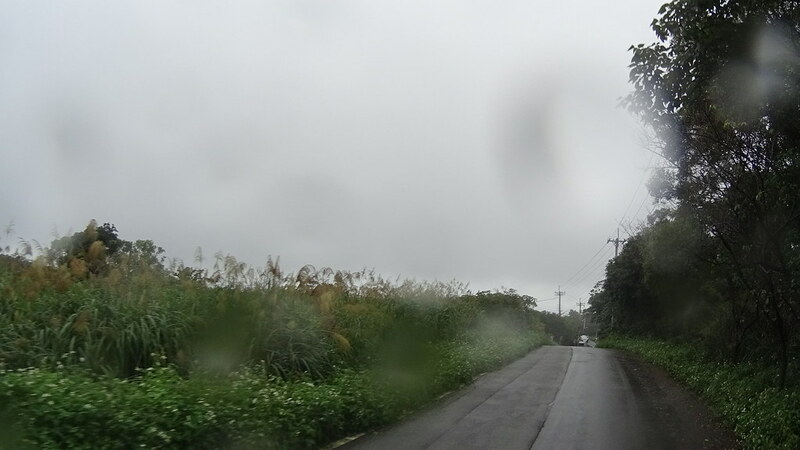 “Fish Road Old Trail Farm”. 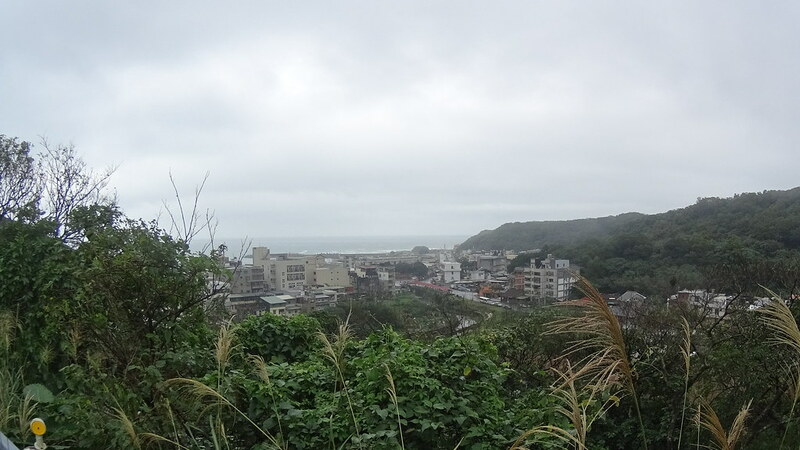 This area had a lot of agricultural plantation. 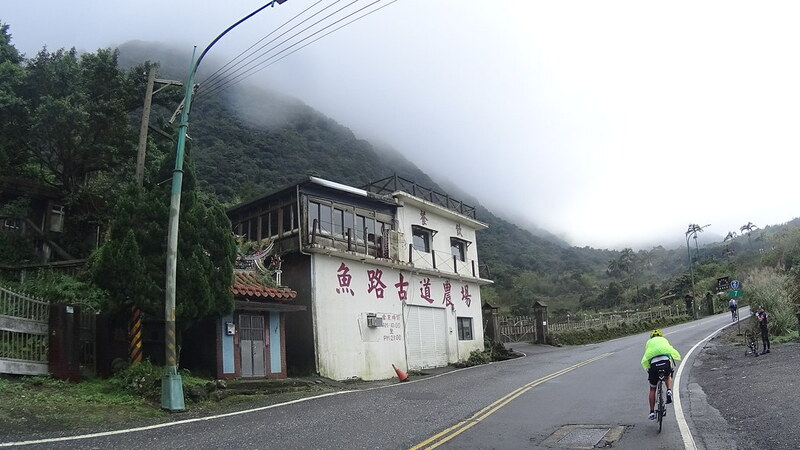 Recently closed beautiful BaYien Village (八菸聚落). 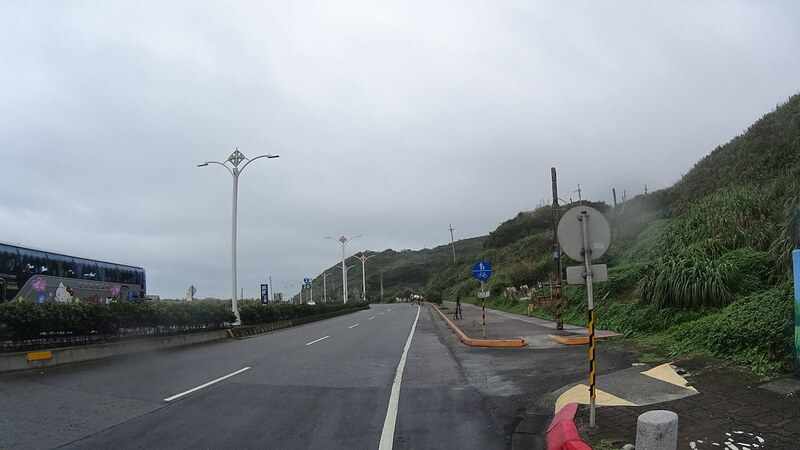 Due to disrespectful visitors destroying local crops and littering the villagers decided to close the village on the weekend. 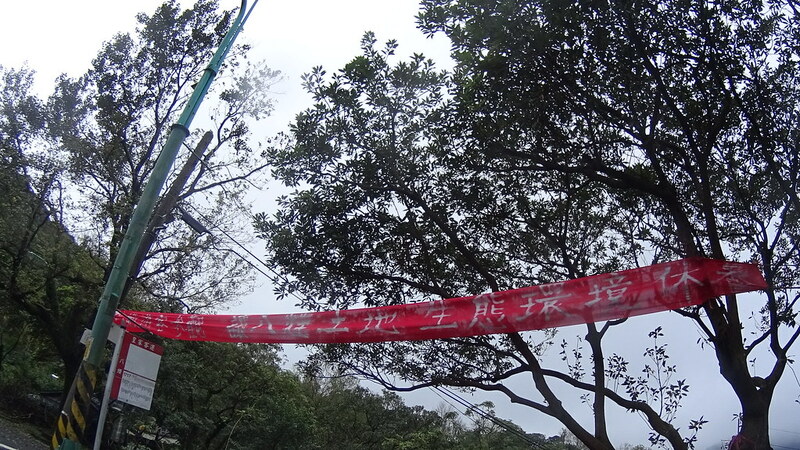 Hope this teaches a lesson to some Taiwanese that greater freedom only comes with greater responsibility. 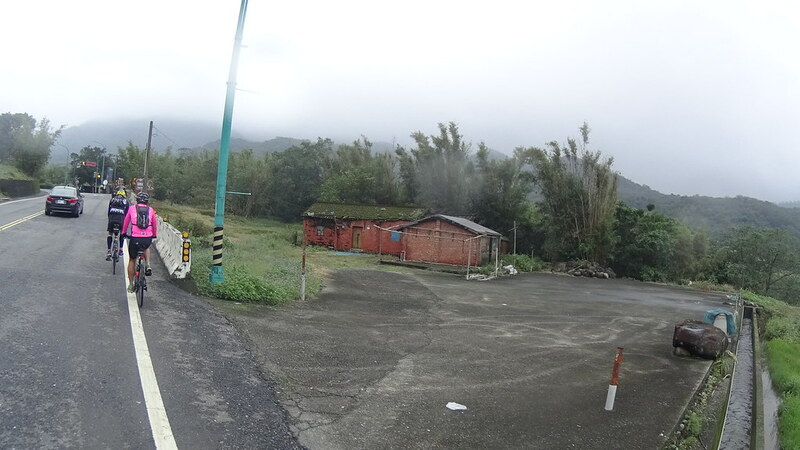 There was another fumarole area along this side of road. 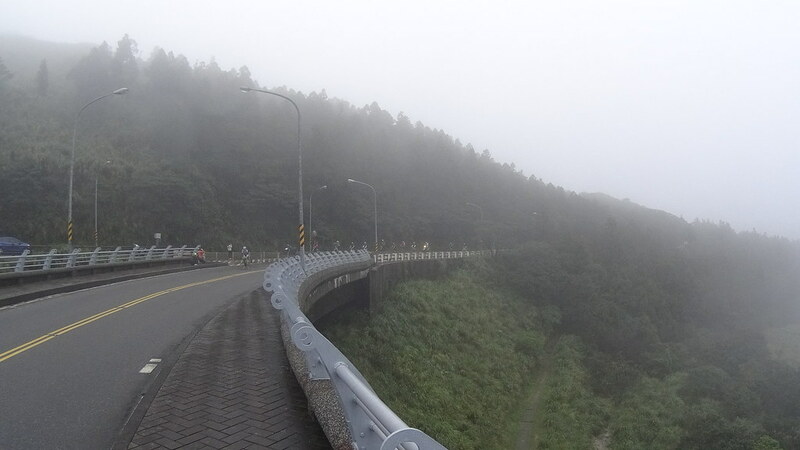 A bridge was required to cross through it. 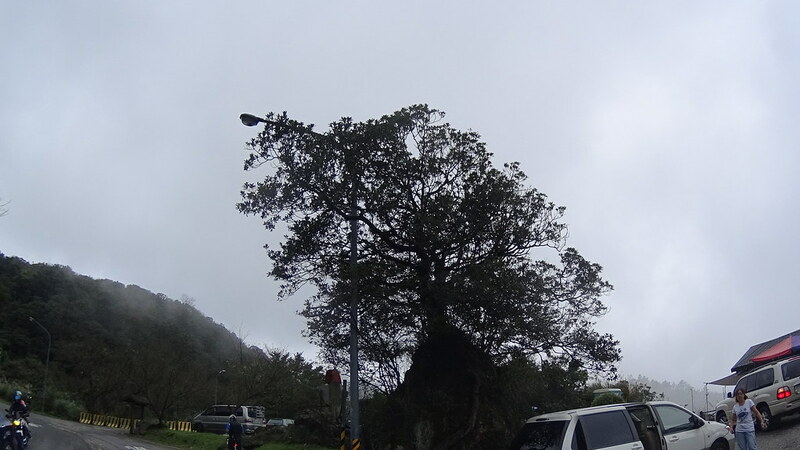 A tree grown on a big rock. 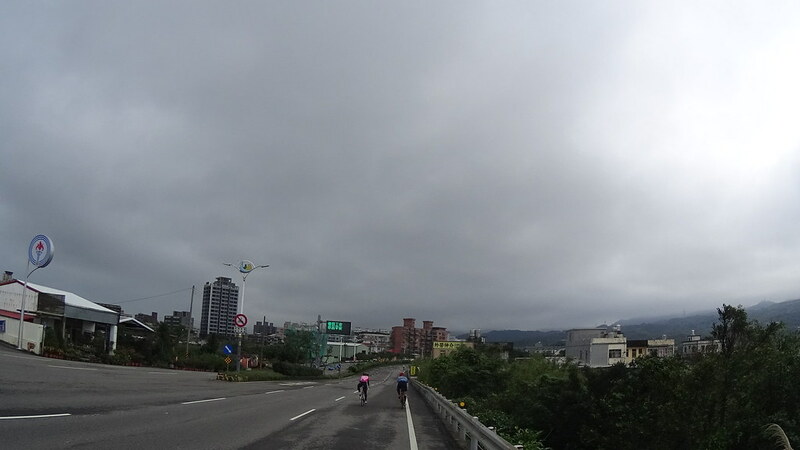 Main YangMinShan ridge was again visible. 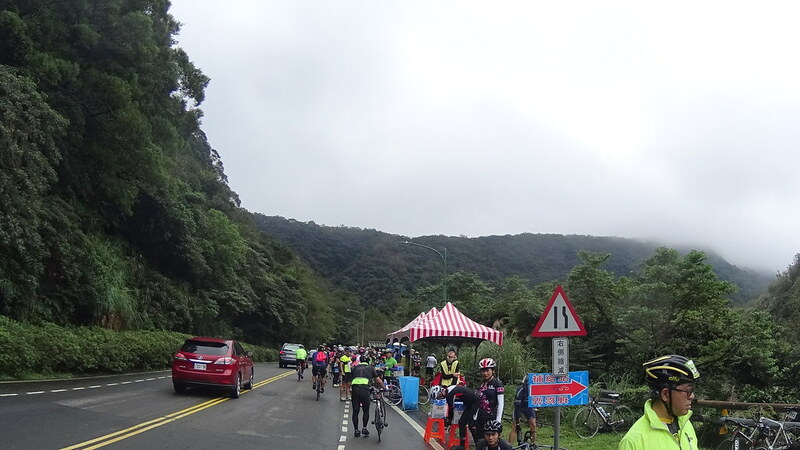 At the route’s last km it turned onto a very steep hill, making almost all cyclists walking their bikes. 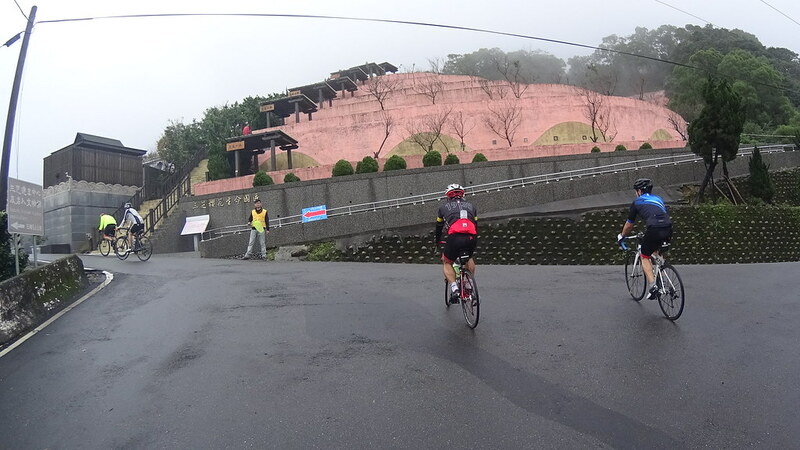 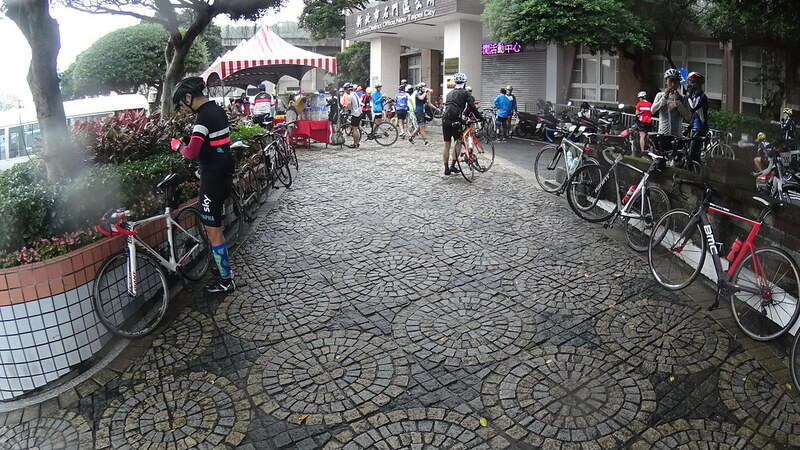 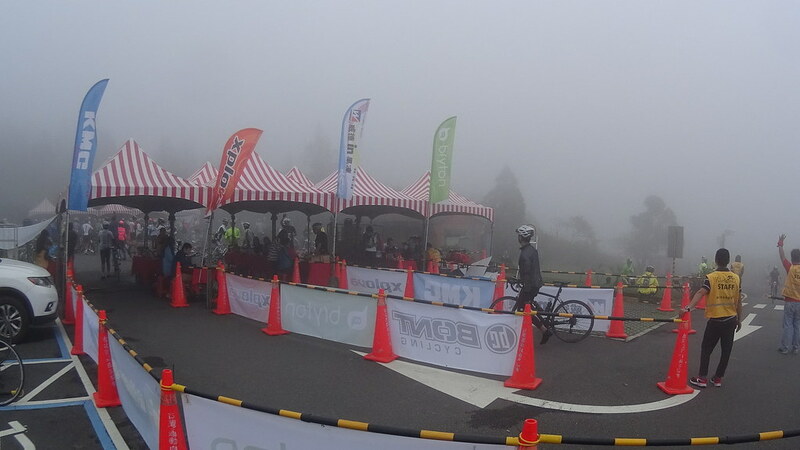 The finish line ended at the MungHuan Lake (夢幻湖) parking lot. 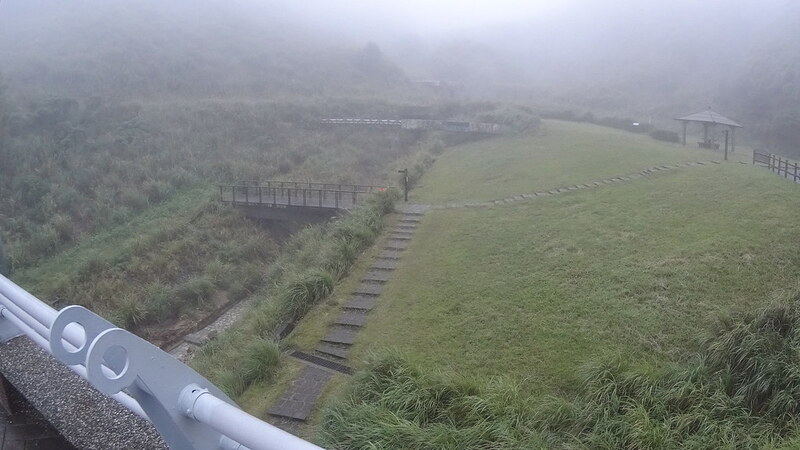 The lake holds the only native quillwort: Isoetes taiwanensis (台灣水韮). 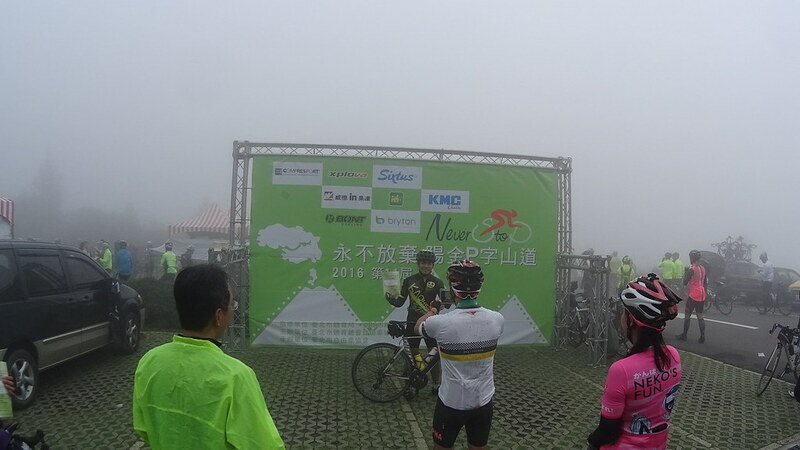 Overall it was a great and challenging ride. 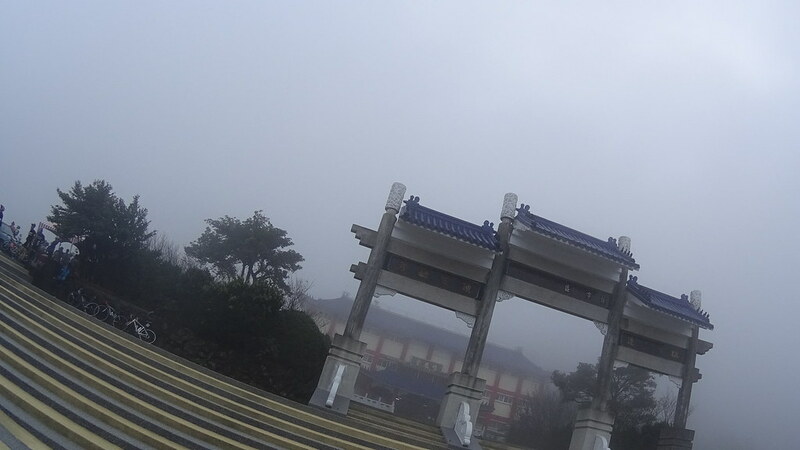 Although the mist blocked out some great views, it created the mystic feel that emphasized YangMingShan’s profound effect on life and death.